A ramble through the Outside Lands of San Francisco. 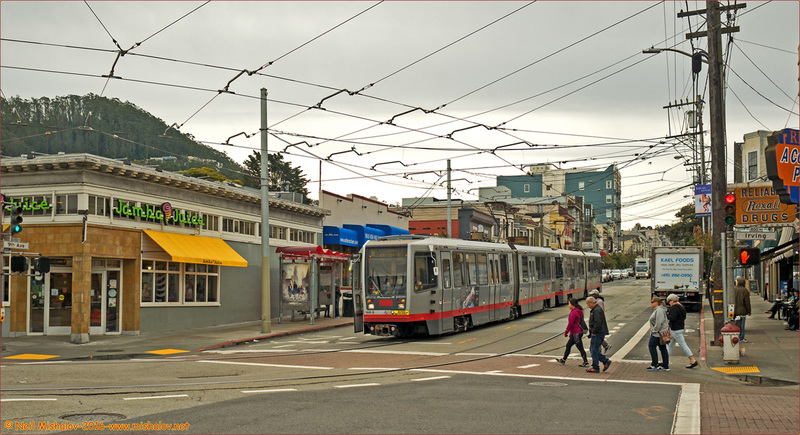 This N-Judah streetcar is on its way to downtown San Francisco. 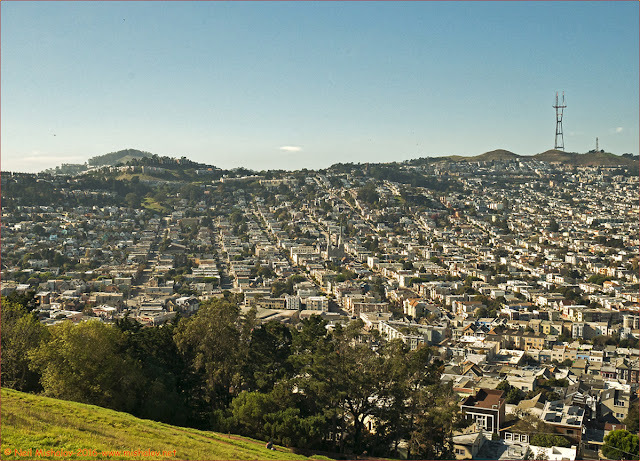 Mount Sutro is visible on the left. The view is looking south. Click on the image to see the full-size photograph. 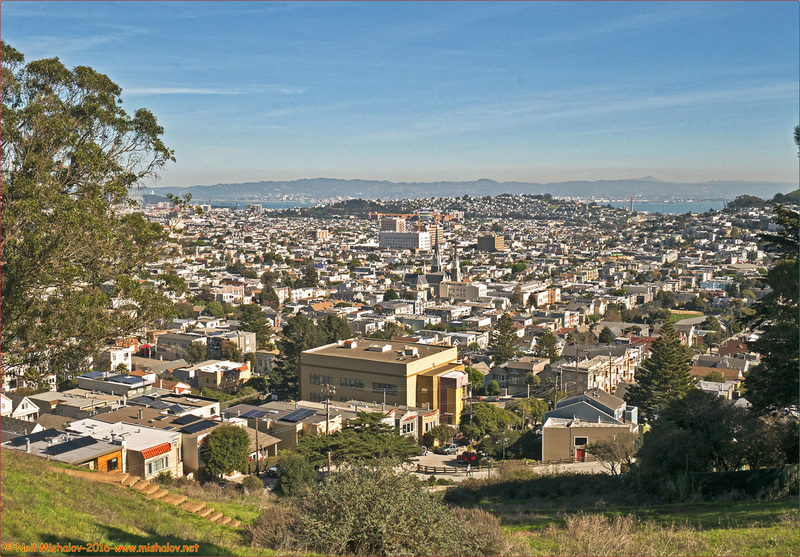 Grand View Park is visible in the distance; it is located in the Inner Sunset District. The view is looking south. Click on the image to see the full-size photo. 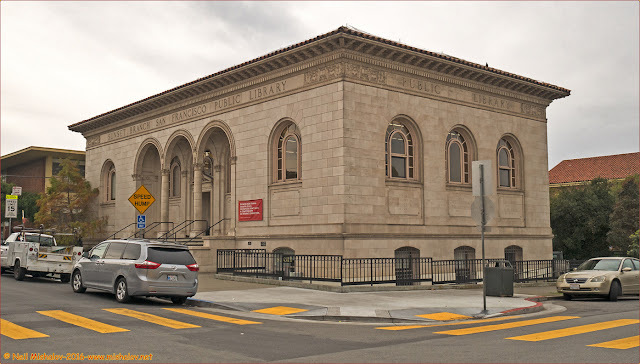 This is the Sunset Branch of the San Francisco Public Library; it was built in 1918. The Sunset Branch of the library system was built with money donated by Andrew Carnegie; it is one of seven public libraries constructed in San Francisco due to the financial contributions made by Mr. Carnegie. Thank you, Andrew Carnegie! The library is located on 18th Avenue at Irving Street. The view is looking southwest. Click on the image to see the full-size photograph. 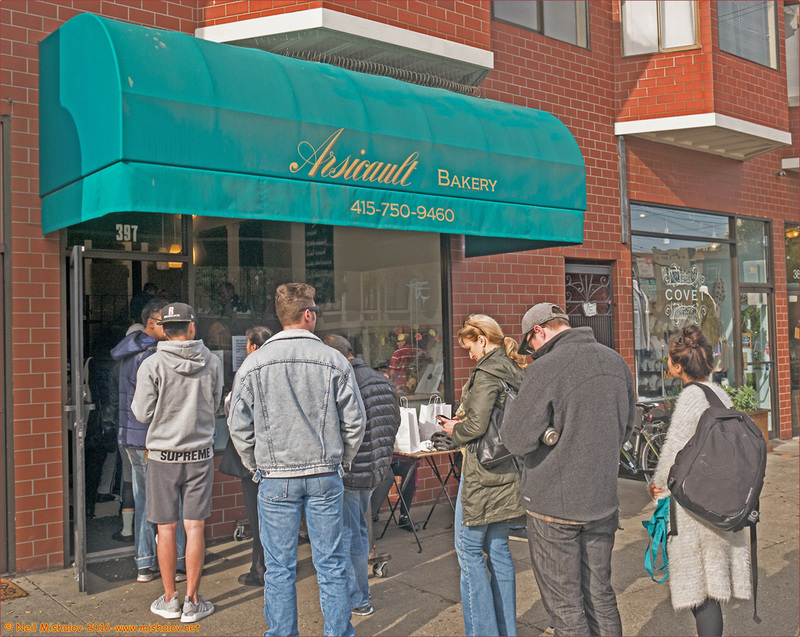 Arsicault Bakery <Two> <Three> is located on Arguello Street in the Richmond District of San Francisco. It was recently named "Bakery of the Year" by Bon Appétit magazine. To quote Bon Appétit: "What does it take to stand out in a city of sourdough savants? 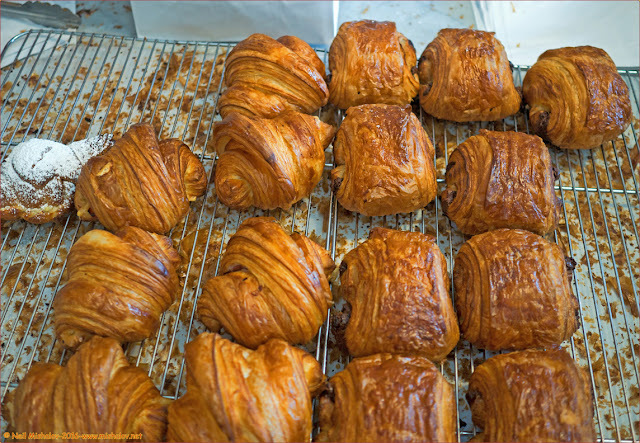 One, and only one, thing: a croissant that’s simultaneously so preposterously flaky it leaves you covered in crumbs, so impossibly tender and buttery on the inside that it tastes like brioche, and so deeply golden that the underside is nearly caramelized." I could not have said it any better. Click on the image to see the full-size photograph. These croissants are fresh from the oven are they are now ready to do their duty! Click on the image to see the full-size photo. 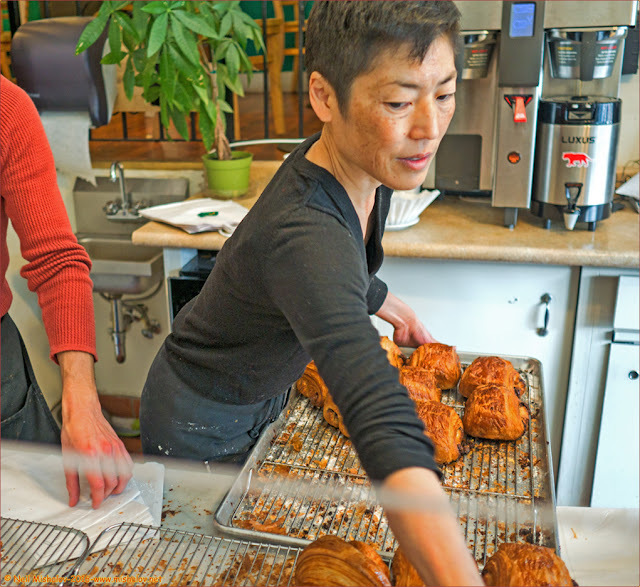 This pleasant woman is bringing warm, fresh from the oven croissants to the customer area. Click on the image to see the full-size photograph. A view from Clement Street looking west. Click on the image to see the full-size photo. 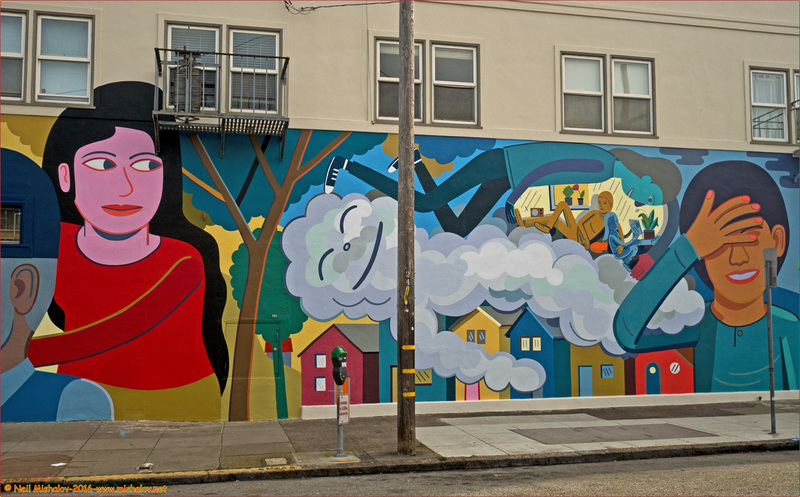 This street art is painted on the exterior of a building located on 3rd Avenue at Clement Street. Click on the image to see the full-size photograph. 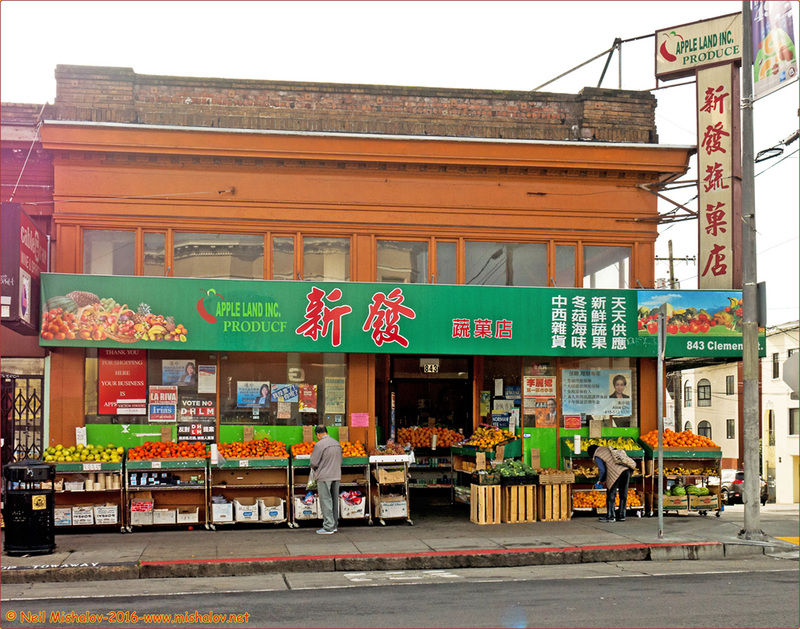 A grocery store located on Clement Street at 5th Avenue. Click on the image to see the full-size photo. 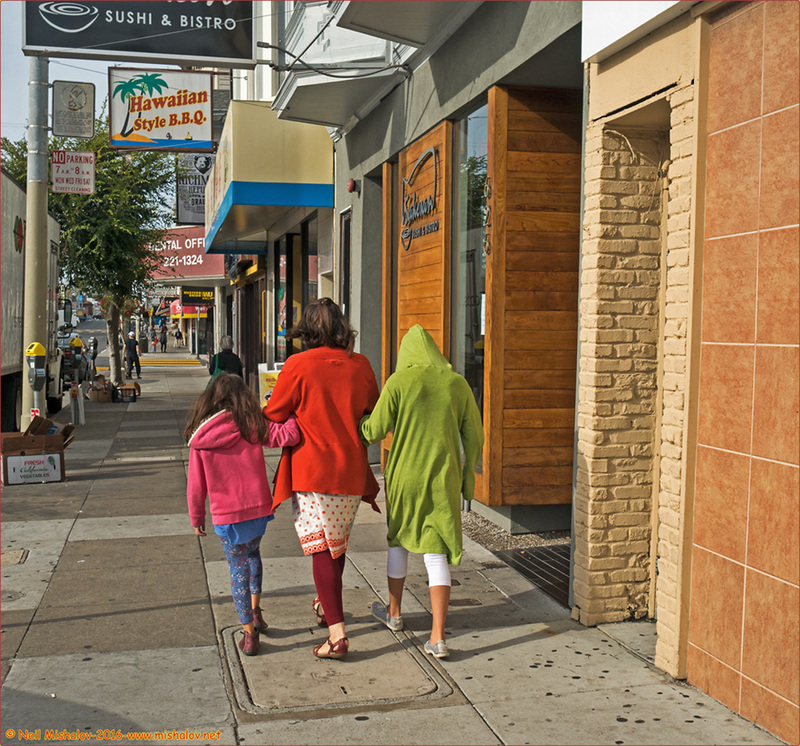 A mother and her two daughters are purposefully walking along Clement Street. Here is a picture of the mother and her oldest daughter taken on Clement Street on 7 January 2017. The view is looking west. Click on the image to see the full-size photo. 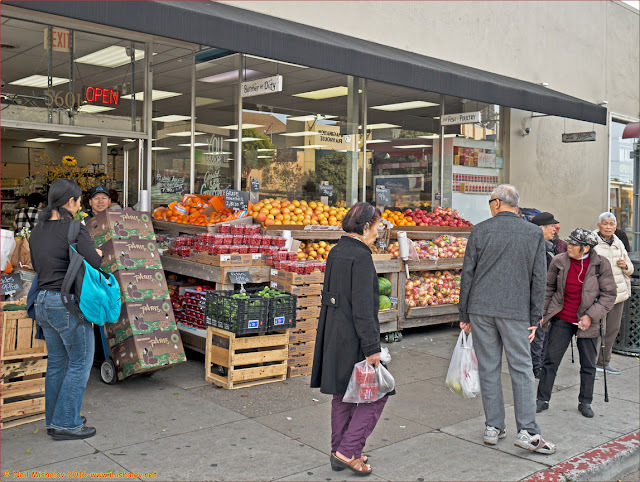 Apple Land Produce market is located on Clement Street at 10th Avenue. Click on the image to see the full-size photograph. 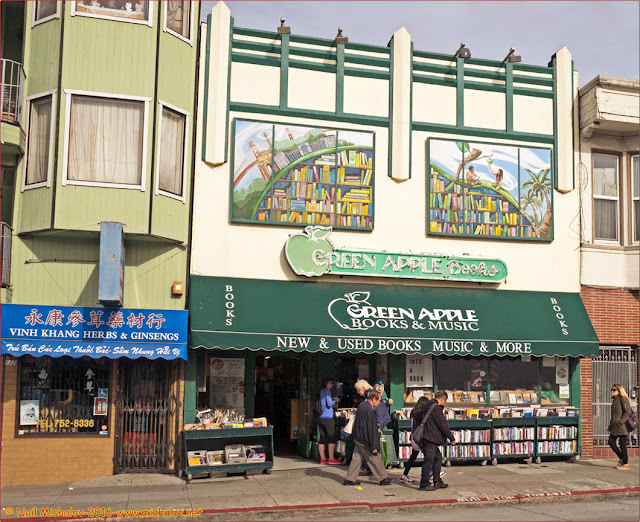 Green Apple Books is an excellent bookstore. It is located on Clement Street at 6th Avenue. Click on the image to see the full-size photo. 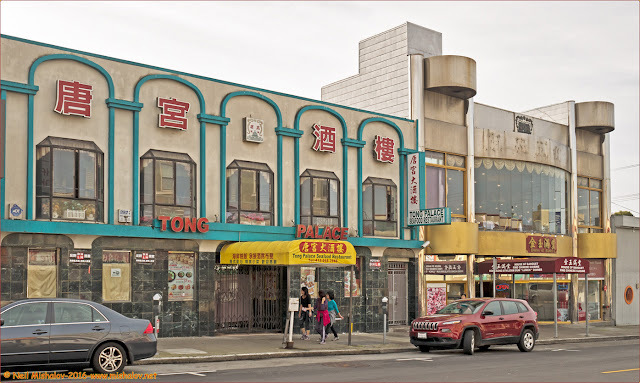 Tong Palace Restaurant and the House of Banquet restaurant are located on Clement Street at 11th Avenue. Click on the image to see the full-size photograph. 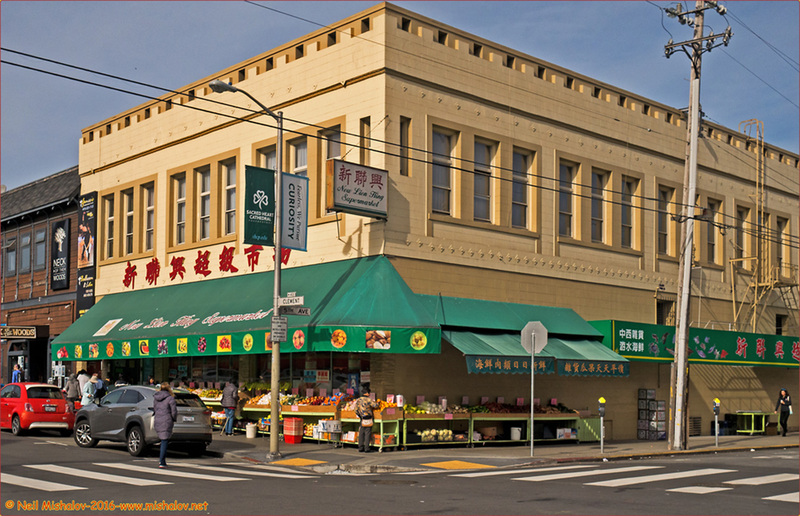 Mainland Market is located on Geary Boulevard at 20th Avenue. Click on the image to see the full-size photo. The distance traveled on 25 November was approximately 5.5 miles (8.9 kilometers). Mile markers are displayed on the GPS generated track. On 22 November the distance traveled was approximately 4.7 miles (7.6 kilometers). The route map for 22 November has not been posted. Click on the image to see the full-size map. My first San Francisco Bay Area Photo Blog contains galleries of photographs that I posted between 2002 and 2011. Click Here to view the 2002 to 2011 photo galleries. Daly City is contiguous with the southwestern boundary of San Francisco. 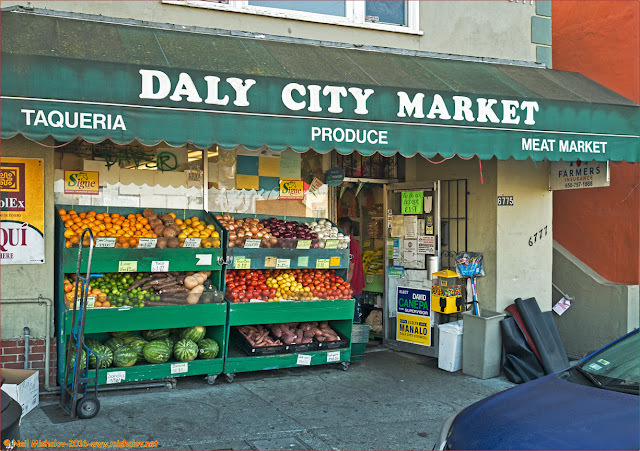 This ramble began at the Daly City BART Station and traveled 8.5 miles northeast through Daly City and San Francisco to Bernal Heights Hill. The route went through the Outer Mission District, the Excelsior District, the College Hill Area and the Bernal Heights neighborhood of San Francisco. 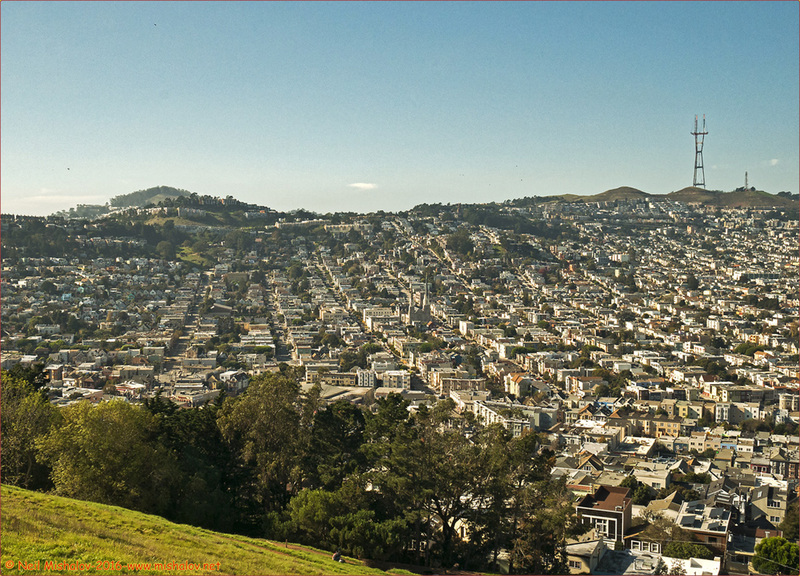 A view of San Francisco as seen from Bernal Heights Park. In the distance is Angel Island; the scene is looking north. Click on the image to see the full-size photograph. The distance traveled was approximately 8.5 miles (13.7 kilometers). Mile markers are displayed on the GPS generated track. The cumulative elevation gain was about 987 feet (300 meters). Click on the image to see the full-size map. On Mission Street in Daly City. Click on the image to see the full-size photograph. 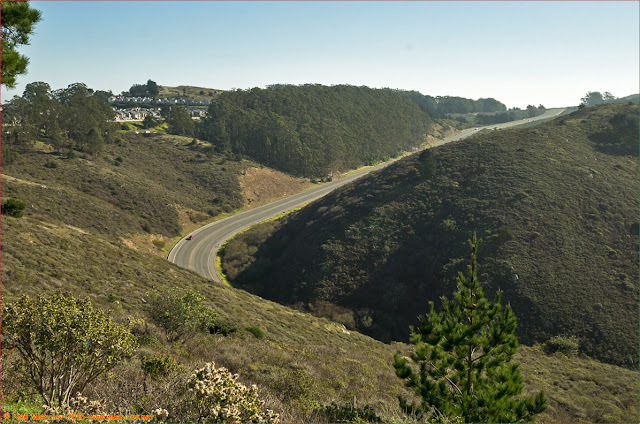 Guadalupe Canyon Parkway traverses San Bruno Mountain from west to east. The view is looking east. Click on the image to see the full-size photo. This view is looking south. Ahead is Colma and Daly City. The Pacific Ocean is to the west, beneath the fog bank. Click on the image to see the full-size photograph. This building was constructed in 1928. 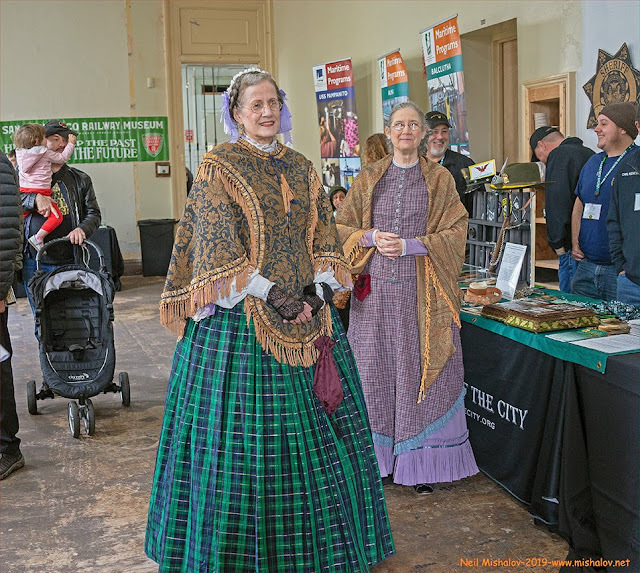 It was originally a branch of the Hibernia Bank, which was founded in 1859. It is now the home to El Chico Produce Store #2 The building is located in the Outer Mission on Mission Street. Click on the image to see the full-size photo. A view looking north from Mission Street. The cross street is Theresa Street. Click on the image to see the full-size photograph. 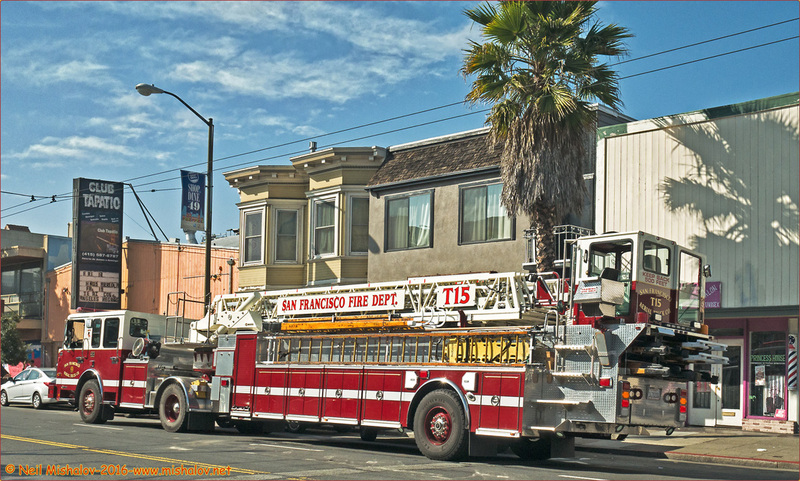 Five of San Francisco's firefighters are taking a coffee break at Cumaica Coffee which is located on Mission Street in the Outer Mission District. The view is looking northwest. Click on the image to see the full-size photo. Dragon House Mixed Martial Arts facility is located on Mission Street in the Excelsior District. Click on the image to see the full-size photograph. 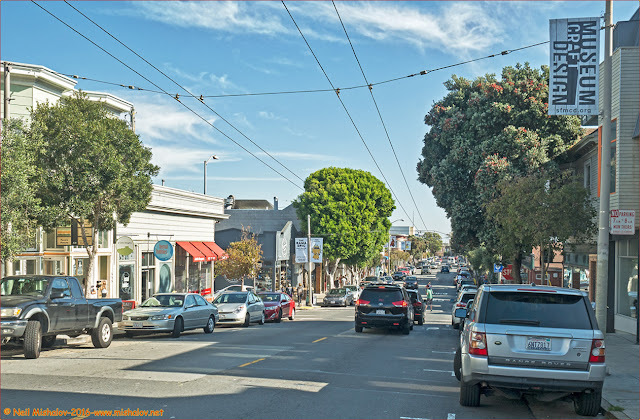 A view from Mission Street looking north, down Admiral Avenue. A portion of Interstate 280 is visible. 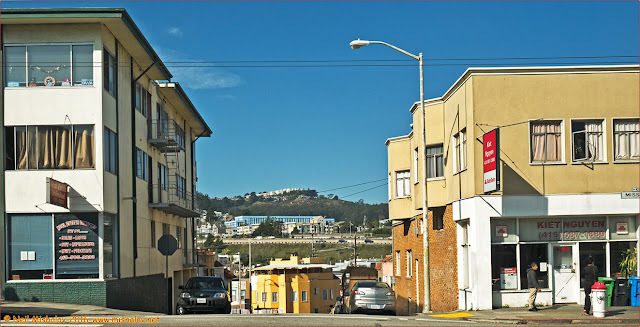 The large blue building is Glen Park Elementry School. The hilly area in the rear is a part of the Diamond Heights neighborhood. Click on the image to see the full-size photo. A view of Mission Street at 26th Street in the Mission District. The view is looking West. Click on the image to see the full-size photograph. This is a view of the southern side of Bernal Heights Park. The photo was taken from Holly Park. Click on the image to see the full-size photo. This is a scene of Cortland Avenue, the main shopping area in the Bernal Heights neighborhood. The view is looking east. Click on the image to see the full-size photograph. Downtown San Francisco. 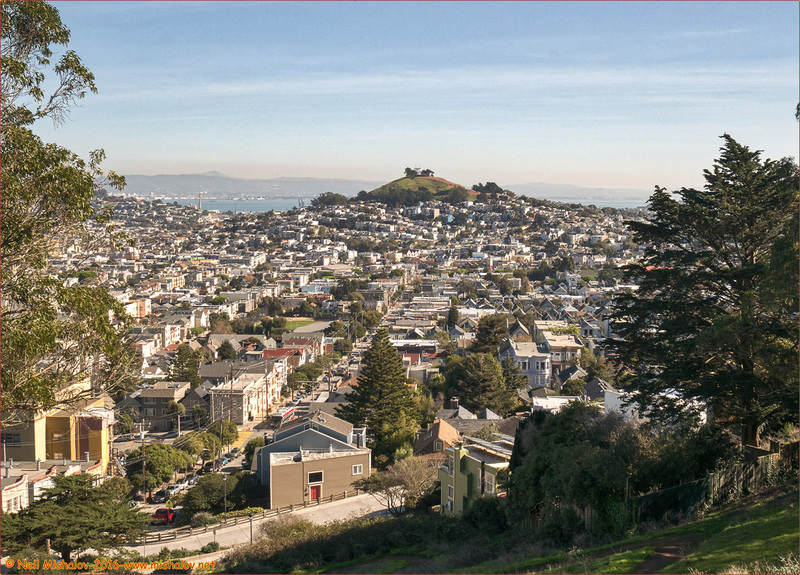 This view is from the west side of Bernal Heights Hill. Click on the image to see the full-size photo. 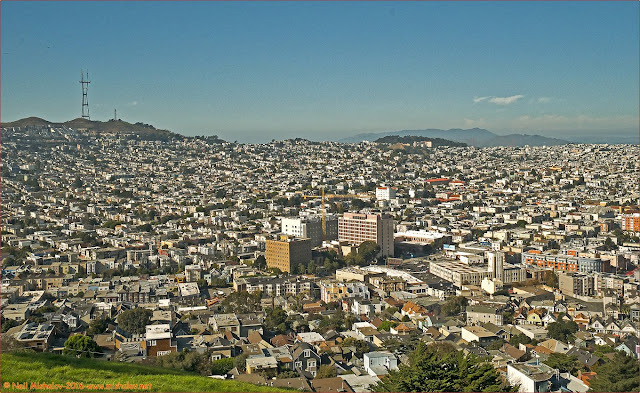 This is a scene of Noe Valley from Bernal Heights Hill. The view is looking west. 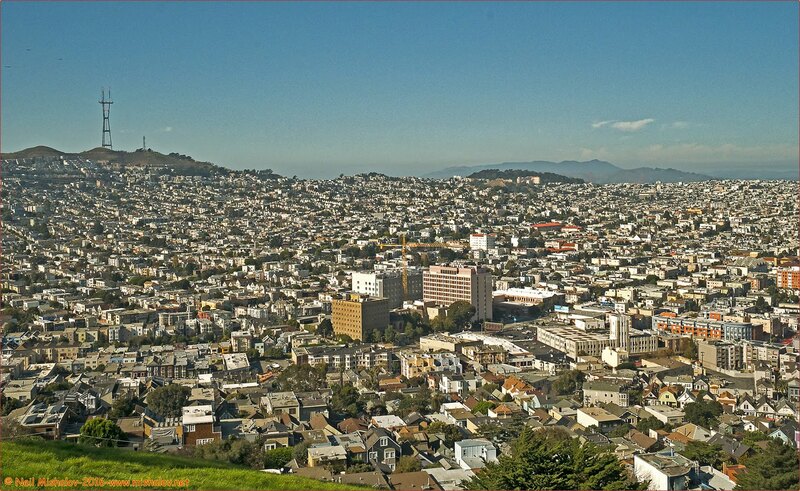 On the left side of the image is Mount Davidson and on the right are Twin Peaks. Click on the image to see the full-size photograph. 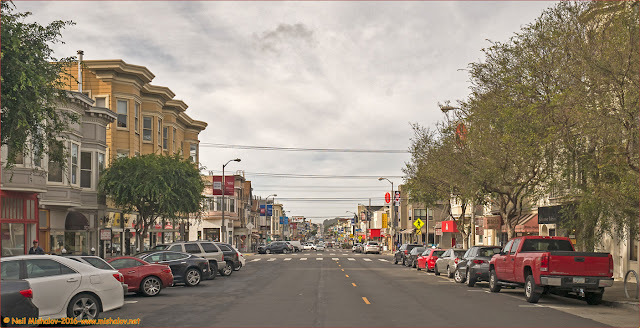 This is a view of Noe Valley, the Mission District, the Castro District and Pacific Heights. 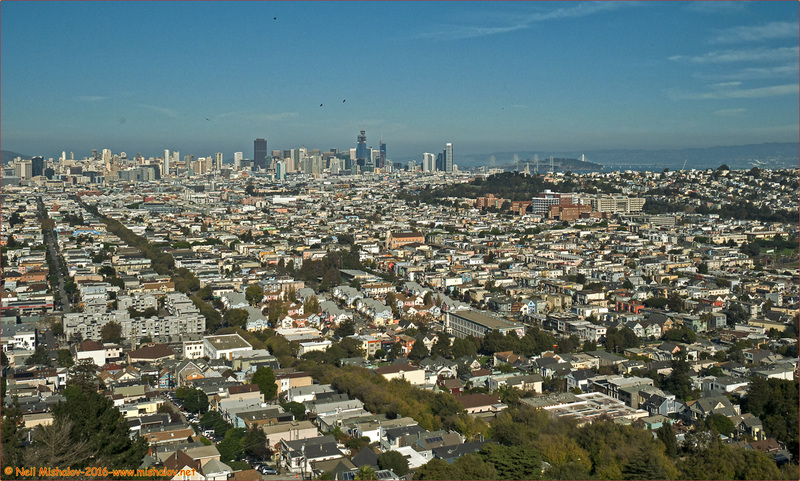 The view is looking northwest from Bernal Heights Hill. The mountain in the distance is Mount Tamalpais. Twin Peaks are on the left. 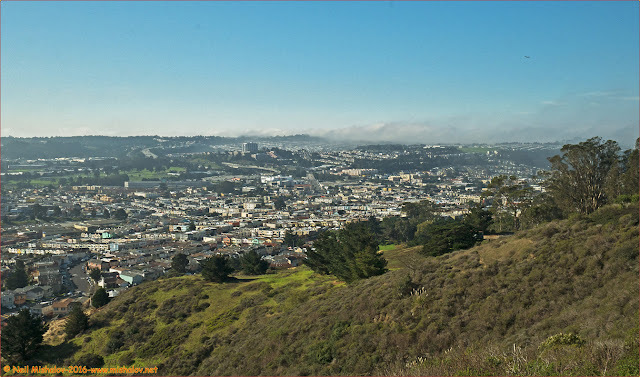 In the near distance straight ahead are Corona Heights Park and Buena Vista Park. Angel Island is visible as is the Golden Gate Bridge, but only barely. Click on the image to see the full-size photo. 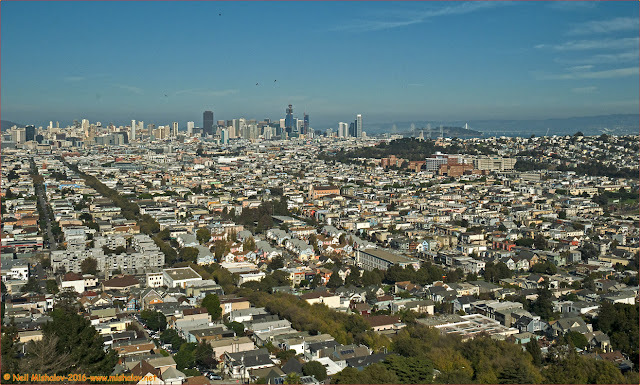 This photo was taken from near the summit, 475 feet (145 meters), of Bernal Heights Hill. The view is looking north. 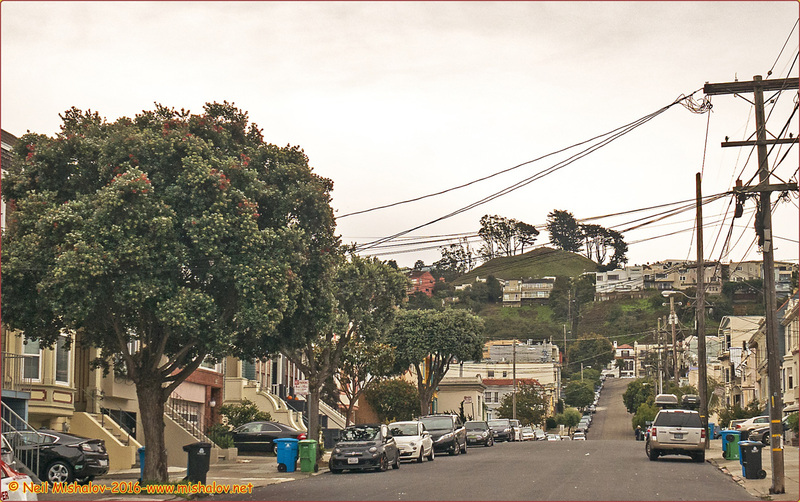 Potrero Hill is visible as are both the western and eastern spans of the San Francisco-Oakland Bay Bridge. Click on the image to see the full-size photograph. 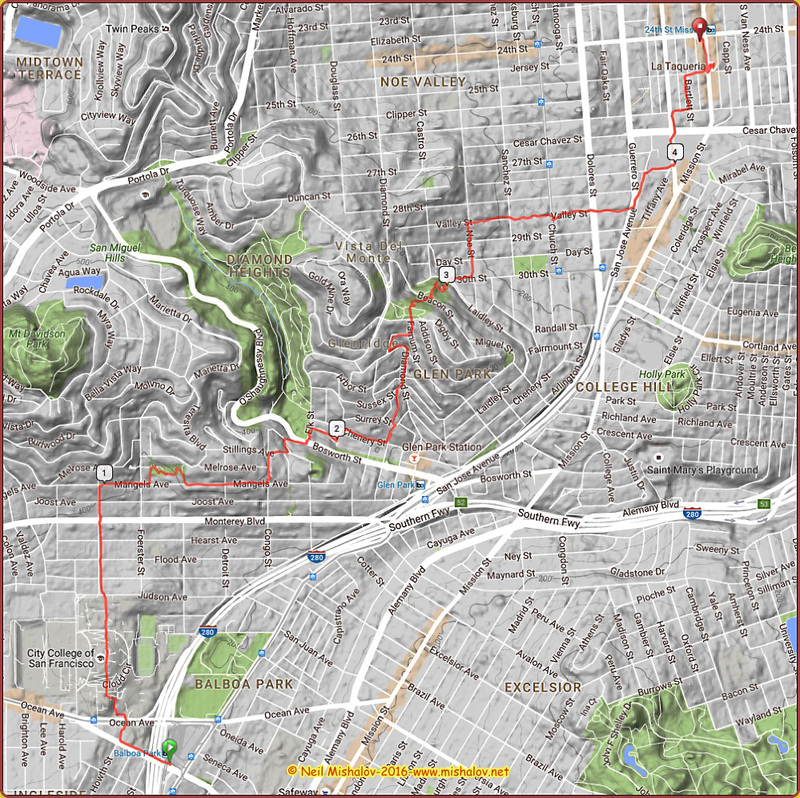 A graph of the elevation changes encountered during the walk. Click on the image to see the full-size graph. I decided to do a ramble from Balboa Park to the Mission District. 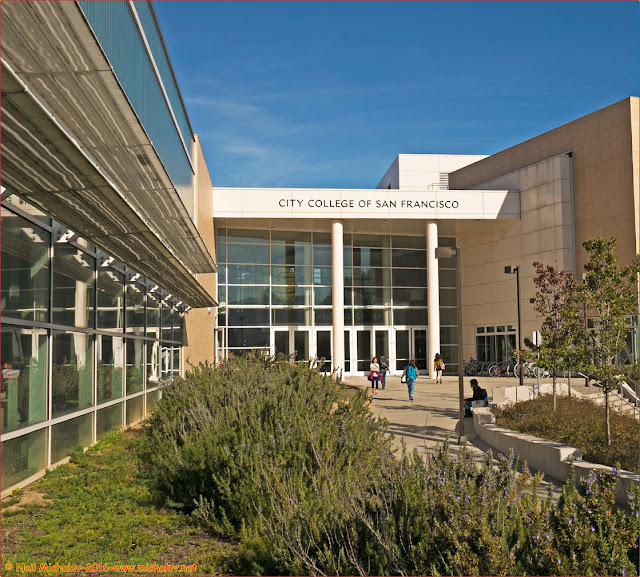 The route I chose went through the grounds of City College of San Francisco, through the Sunnyside District and also Sunnyside Playground. 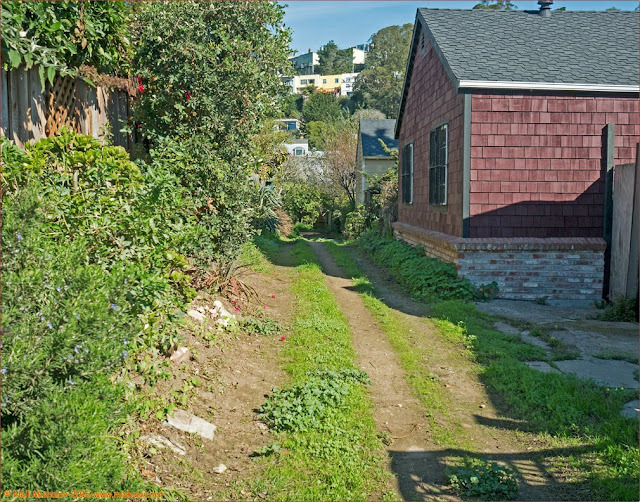 Then it was into the Glen Park Neighborhood and through Walter Haas Park and Billy Goat Hill. 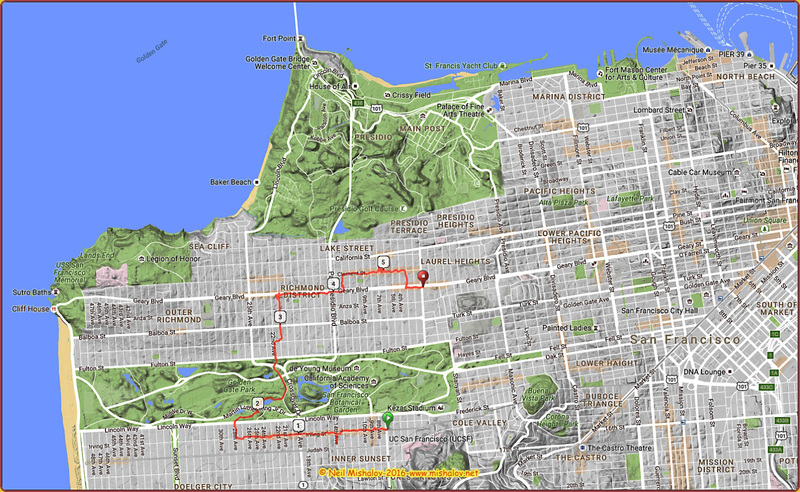 After which we rambled through the southern portion of Noe Valley. 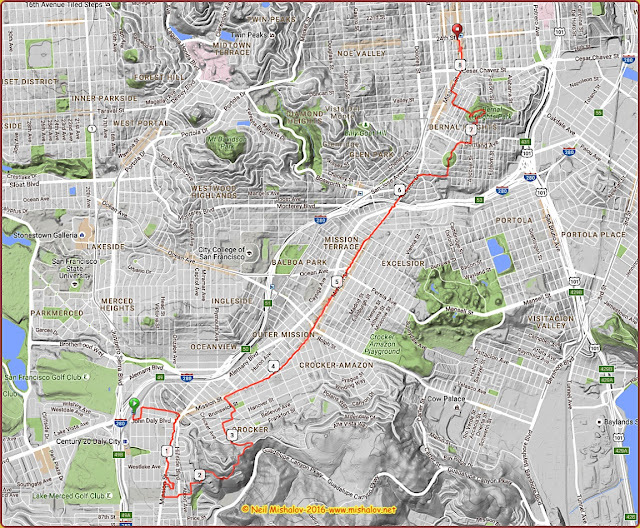 We finished the ramble in the Mission District, with a lunch stop at La Taqueria. 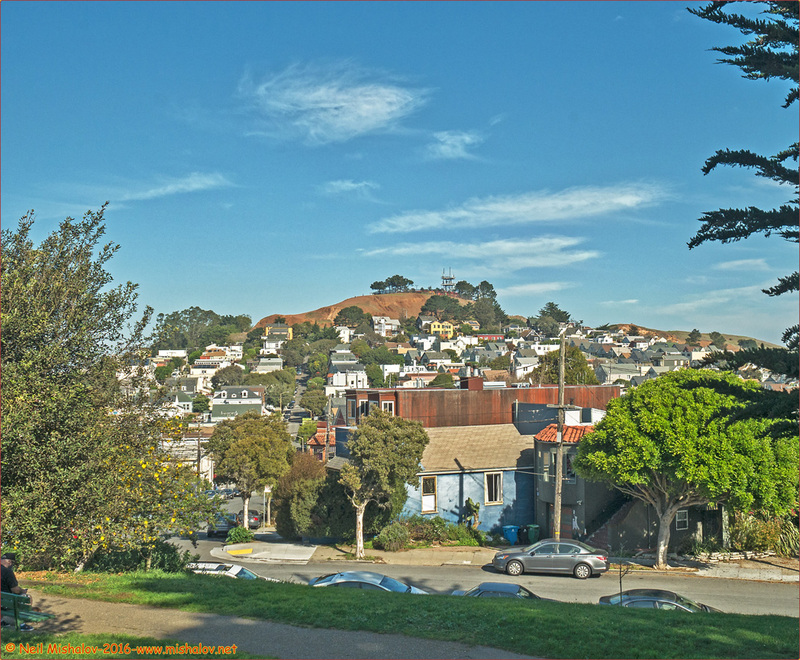 This is a view from Billy Goat Hill Park. 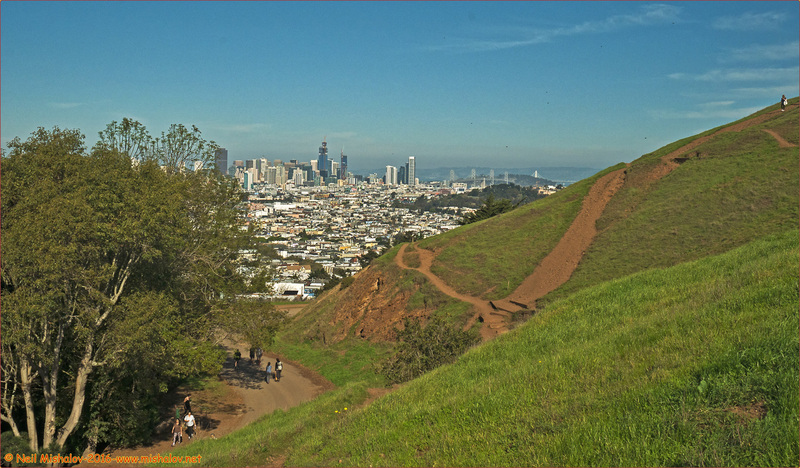 The view is looking east; Bernal Heights Park is straight ahead. Click on the image to see the full-size photograph. The distance traveled was approximately 4.6 miles (7.4 kilometers). Mile markers are displayed on the GPS generated track. The cumulative elevation gain was about 653 feet (199 meters). Click on the image to see the full-size map. 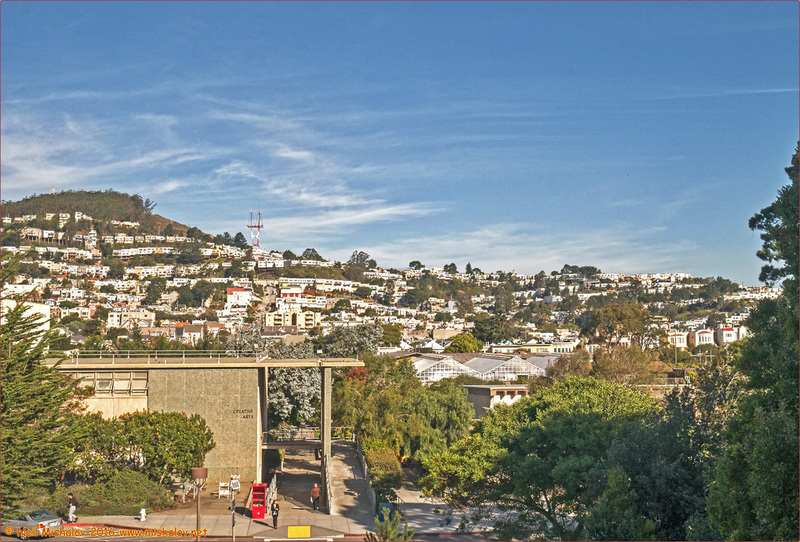 A view from the campus of City College of San Francisco. Click on the image to see the full-size photograph. Here is another view from the campus of City College of San Francisco. Straight ahead on the left is Mount Davidson; at 928 feet (283 meters) Mount Davidson is the tallest natural point in San Francisco. If you look closely, you can see the very top of the concrete cross which is located on the summit of Mount Davidson. The view is looking north. Click on the image to see the full-size photo. Heading down Mangels Avenue. 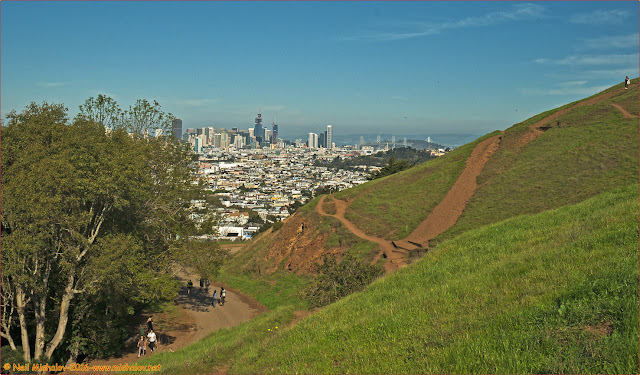 The top of the hill on the right side of the photo is part of John McLaren Park, the second largest park in San Francisco. 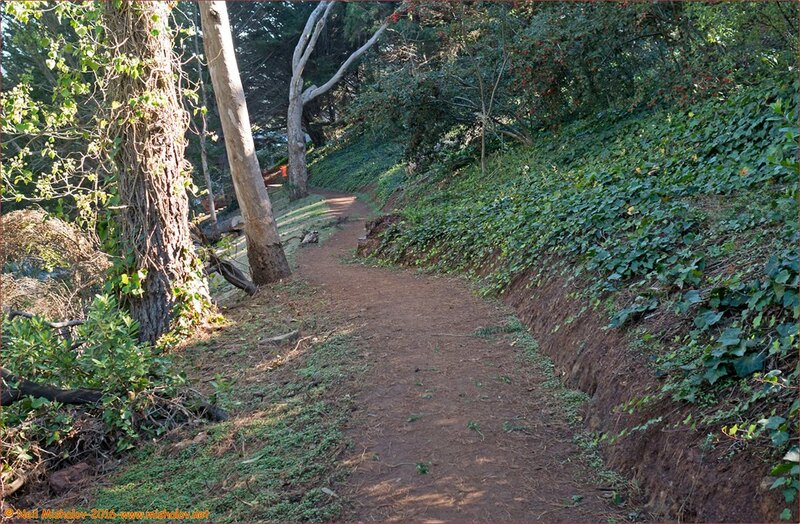 Golden Gate Park is the largest park. The view is looking east. Click on the image to see the full-size photograph. 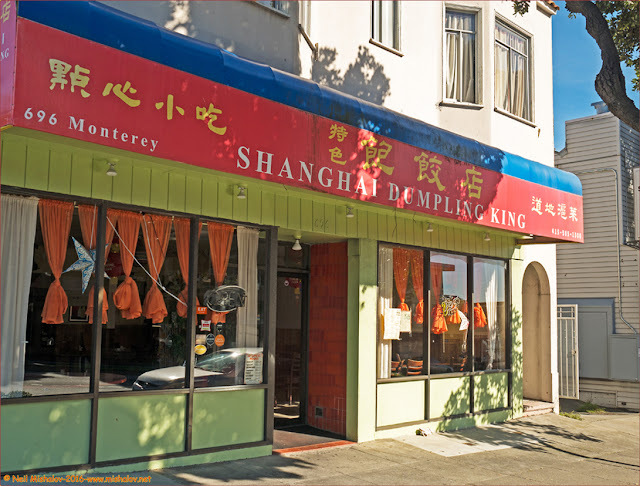 Shanghai Dumpling King is sited on Monterey Boulevard. The view is looking north. Click on the image to see the full-size photo. 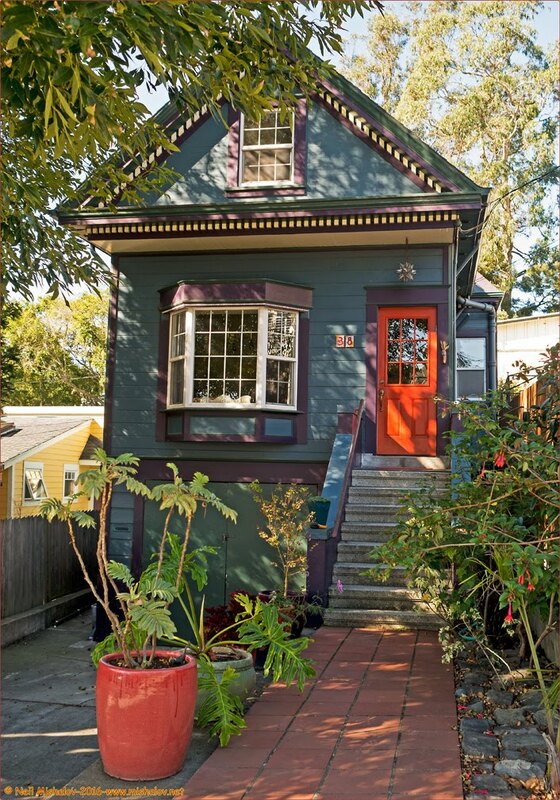 This house is located at 38 Lippard Avenue. The view is looking west. Click on the image to see the full-size photograph. 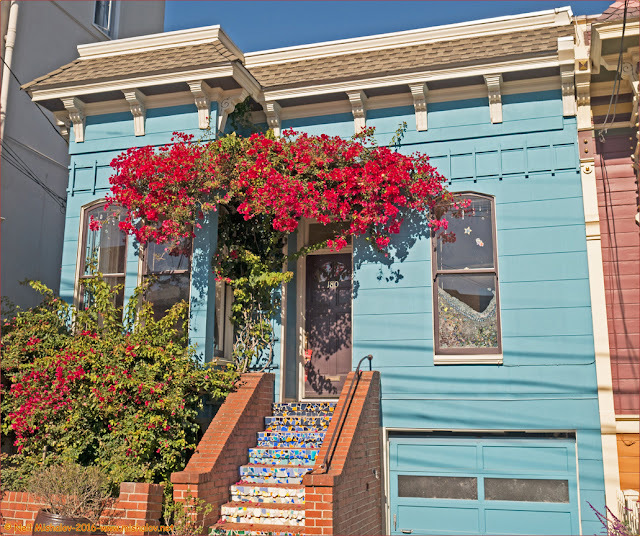 This house is located at 508 Congo Street. The view is looking east. Click on the image to see the full-size photo. There are still a few dirt roads in San Francisco; this is one of them. 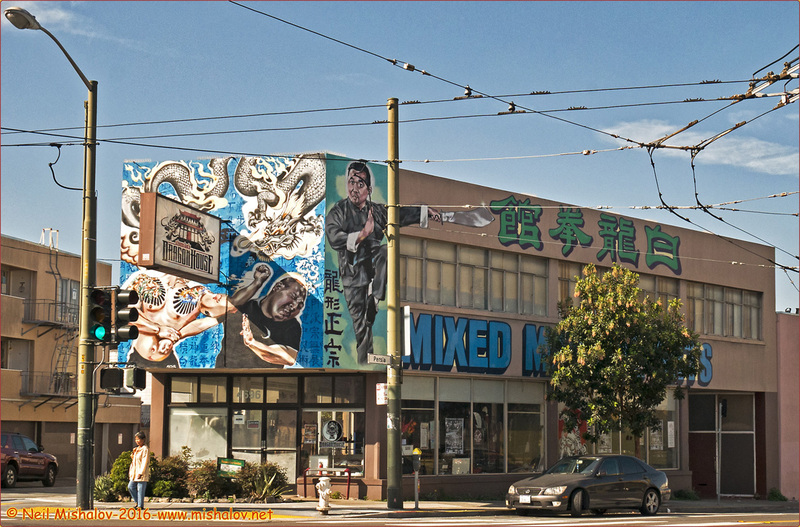 Ohlone Way is located between Surrey Street and Sussex Street. The view is looking north. Click on the image to see the full-size photograph. A view from Billy Goat Hill. Straight ahead is Potrero Hill. Visible on the right at approximately 40 miles in the distance, and at an elevation of 3,849 feet (1,173 meters), is the summit of Mount Diablo. The view is looking east. Click on the image to see the full-size photo. This is a six image panoramic photo taken from Billy Goat Hill. Downtown San Francisco is straight ahead. The view is looking northeast. Click on the image to see the full-size photograph. In Billy Goat Hill Park. Click on the image to see the full-size photograph. 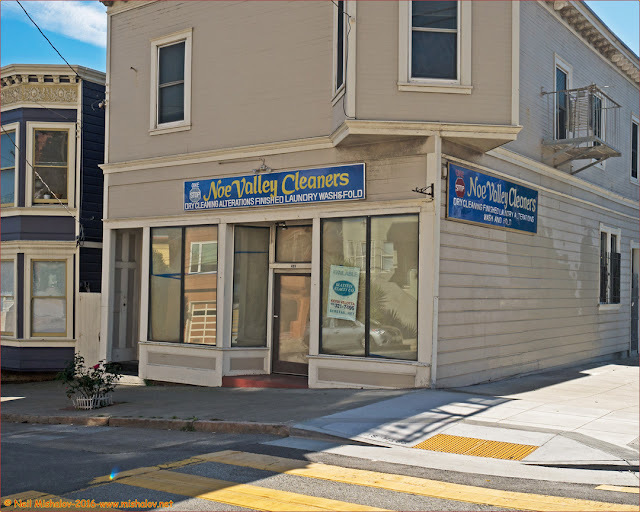 Noe Valley Cleaners is now out of business. 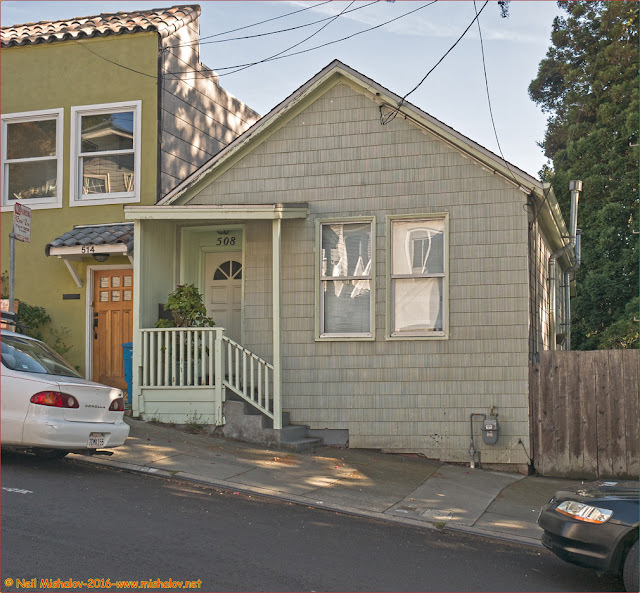 The location is 499 29th Street in the Noe Valley District. Click on the image to see the full-size photo. 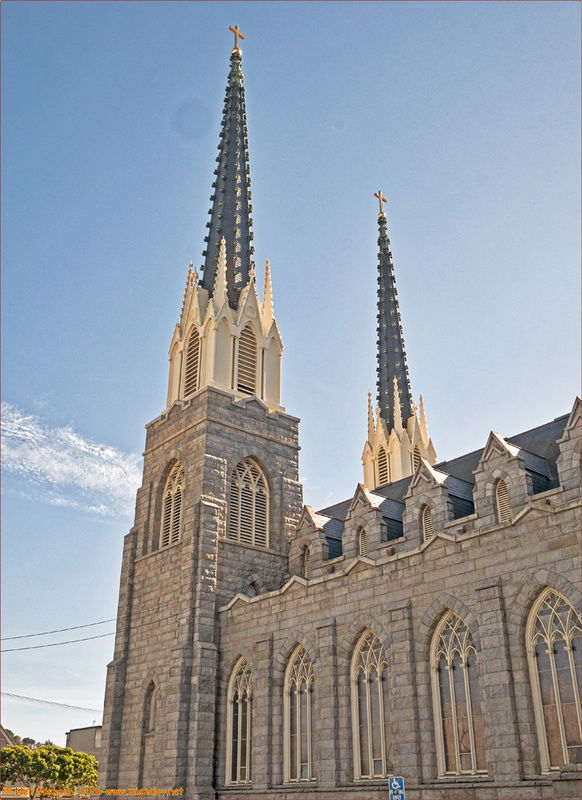 This is St. Paul's Catholic Church. 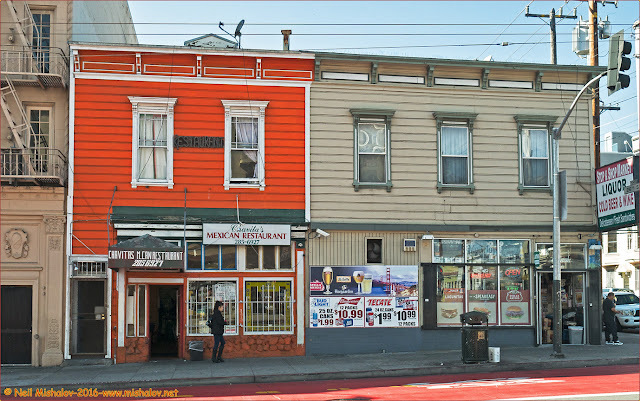 The building was constructed in 1897; it is located on Valley Street in the Mission District. Click on the image to see the full-size photograph. This house is located at 180 Valley Street. Click on the image to see the full-size photo. 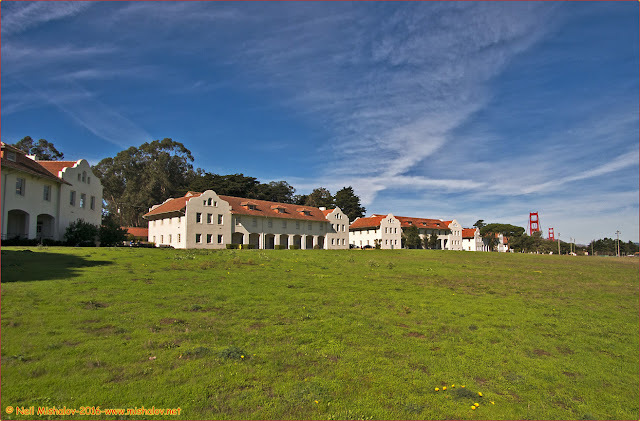 I went to the Presidio of San Francisco on the 3rd and 5th of November 2016 to visit Gun Battery Chamberlin and Nike Missile launching site SF-89L. I was also able to enter the site of Gun Battery Dynamite which is usually closed to the public. 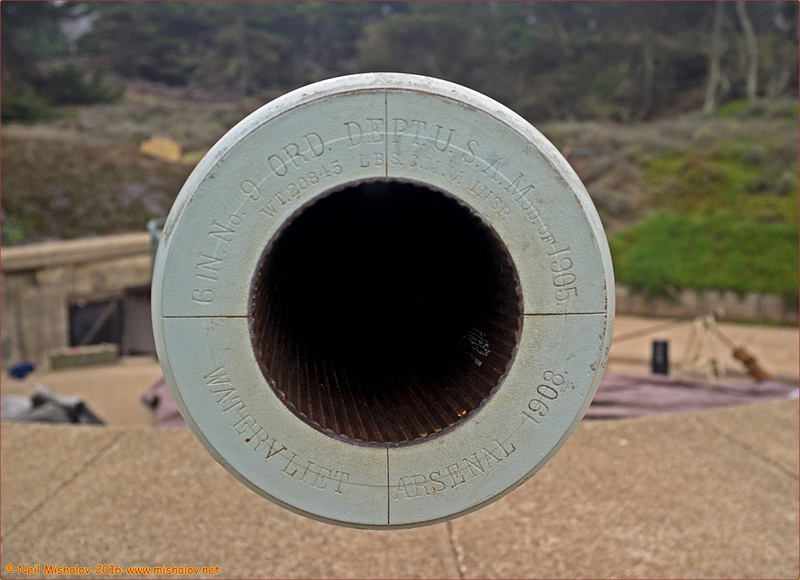 This gun battery became operational in 1904; it originally had four 6-inch disappearing guns. The weapon got the name ‘disappearing’ from its innovative design; the gun is mounted on a carriage that lowers while it’s being loaded, to protect it from attackers. Each gun could shoot two rounds a minute up to a range of nine miles; it took about 25 soldiers to man each gun. 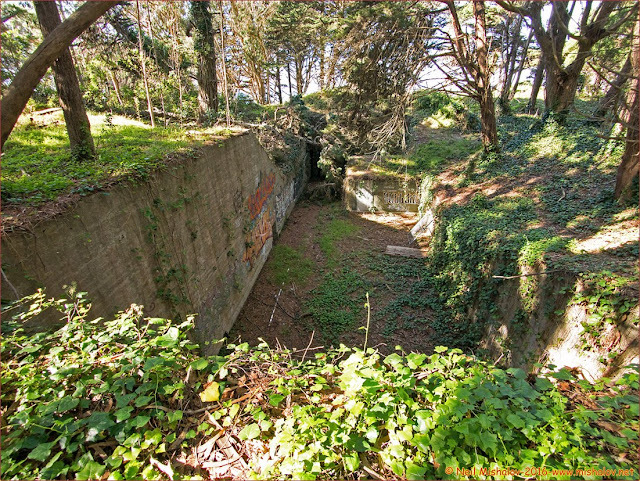 Battery Chamberlin was the last coastal fortification to be constructed at Fort Winfield Scott, and it was one of 15 Endicott gun batteries sited at the Presidio. The U.S. entry into World War I resulted in a widespread removal of large caliber United States coastal defense guns for service in Europe. 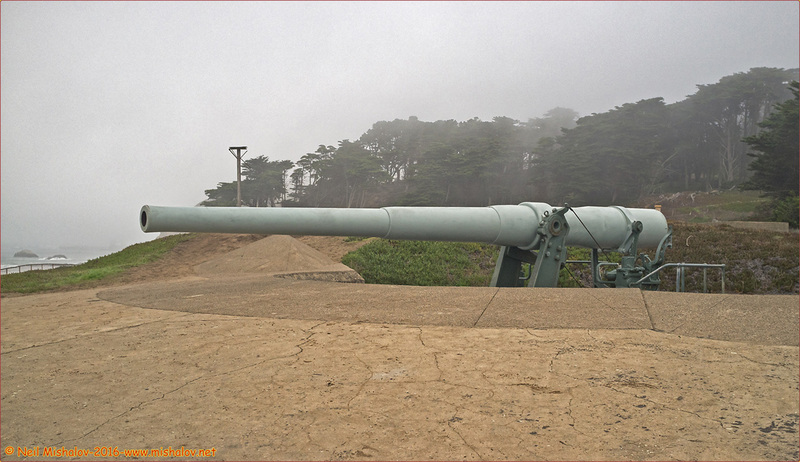 In 1917, the four guns of Battery Chamberlin were sent to Europe, for use in France. The four guns were returned to the United States in 1919. Three of the guns were ordered scrapped, and the fourth gun was sent to Benicia Arsenal, California. In 1920, after being unarmed for three years, Battery Chamberlin received two six-inch non-disappearing guns. These two guns were manned through World War II. 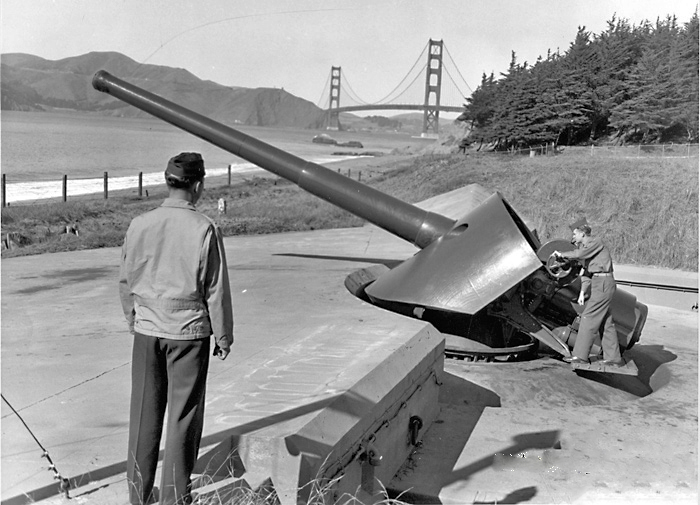 Both six-inch guns were removed in 1948 when the Coast Artillery Corps was called out of service. Battery Chamberlin today has a single 6-inch disappearing gun on display. The gun on display was originally emplaced in Brooklyn, New York at Battery Livingston in Fort Hamilton. The gun was removed from Fort Hamilton and remounted in Battery Schofield at the United States Military Academy at West Point, New York. The gun was later given to the Smithsonian Institution. 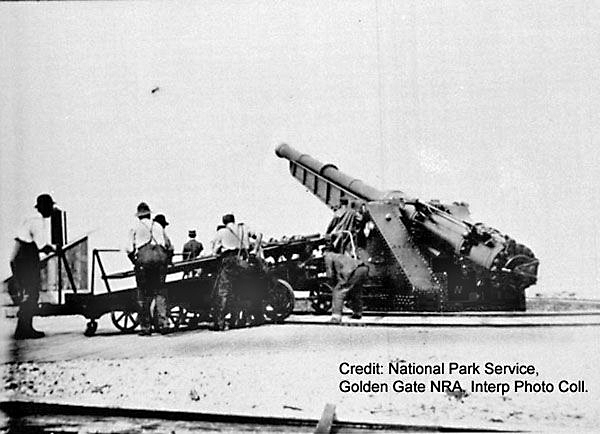 The Smithsonian eventually donated the gun in 1977 to the Golden Gate Recreation Area. 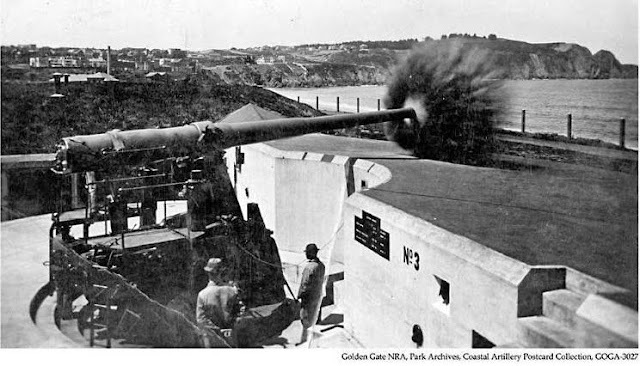 The gun was placed at Battery Chamberlin for public viewing. The gun is very similar to the original guns at Battery Chamberlin. This is the only remaining disappearing gun on the West Coast. There is a small museum located in one of Battery Chamberlin's ammunition magazines. The disappearing 6-inch gun at Battery Chamberlin is demonstrated to the public on the first full weekend of every month from 11 am to 3 pm. Admission is free. NOW This 6-inch disappearing gun is usually covered with tarpaulins to protect it from the weather. This is the first Saturday of the month and a docent has just removed the tarpaulins to display the gun to the public. Click on the image to see the full-size photo. THEN This picture was taken in 1915. It shows a test firing of one of the four original 6-inch disappearing guns which were installed at Battery Chamberlin. Click on the image to see the full-size photograph. 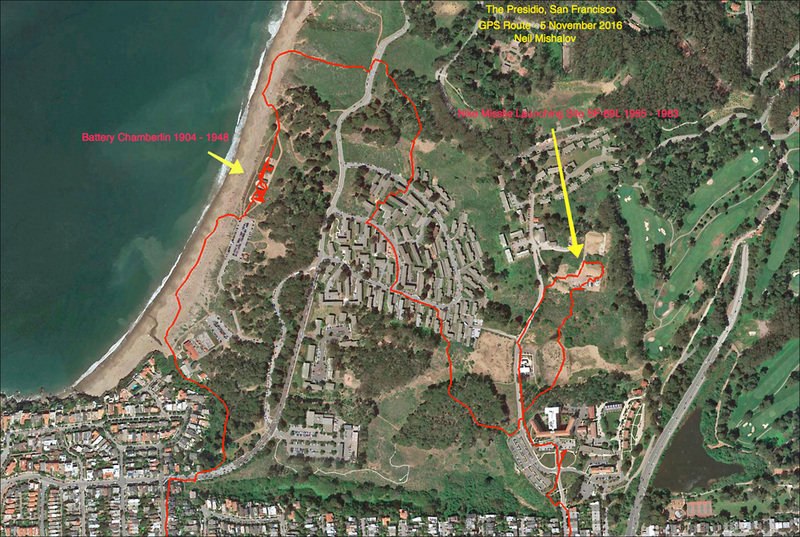 This Google Earth map shows the route I took through the Presidio on 3 November when I visited Battery Chamberlin and Battery Dynamite. Click on the image to see the full-size Google Earth map. 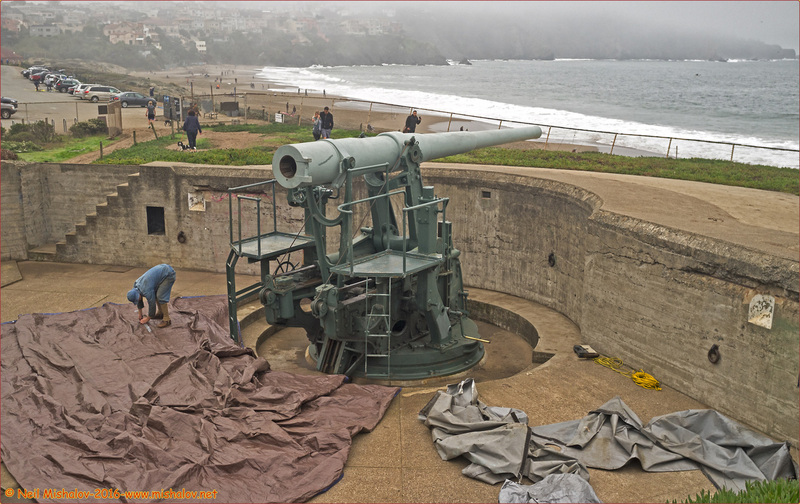 Battery Chamberlin's disappearing 6-inch gun as seen on a foggy Saturday morning. Click on the image to see the full-size photograph. 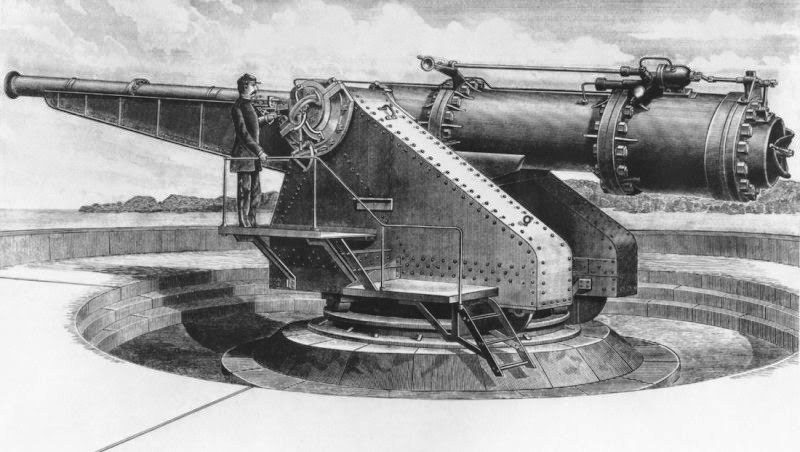 Battery Chamberlin's disappearing 6-inch gun with a view of the gun's carriage. Click on the image to see the full-size photo. This is the muzzle of the six-inch gun. The following information is located on the muzzle: This 6-inch gun is serial #9. The gun weights 20,845 pounds. It is a 1905 model of the gun; and the gun was manufactured in 1908 at Watervliet Arsenal, New York. Click on the image to see the full-size photograph. The western portion of Battery Chamberlin. The mouth of San Francisco Bay is visible in the distance. The view is looking west. Click on the image to see the full-size photo. The eastern section of Battery Chamberlin. The Marin Headlands are visible in the distance. The view is looking north. Click on the image to see the full-size photograph. 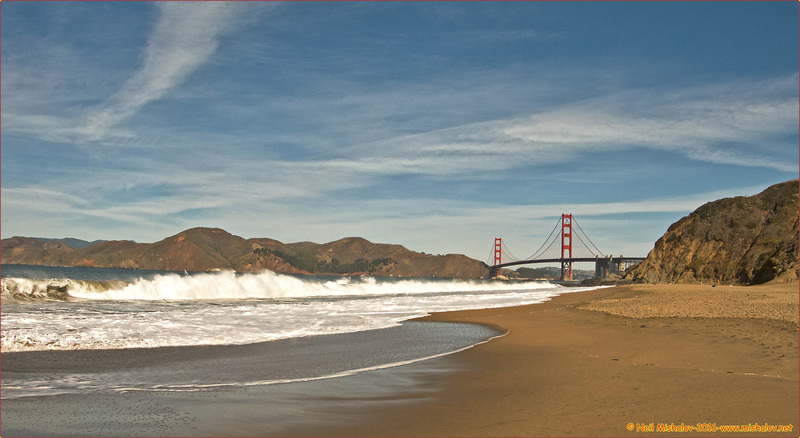 A view from Baker Beach looking north. Click on the image to see the full-size photo. THEN. Two six-inch, non-disappearing guns were installed at Battery Chamberlin in 1920. The guns were operational through 1946. This picture was taken circa 1945. Click on the image to see the full-size photograph. NOW. This is a view of the same gun emplacement. Click on the image to see the full-size photograph. 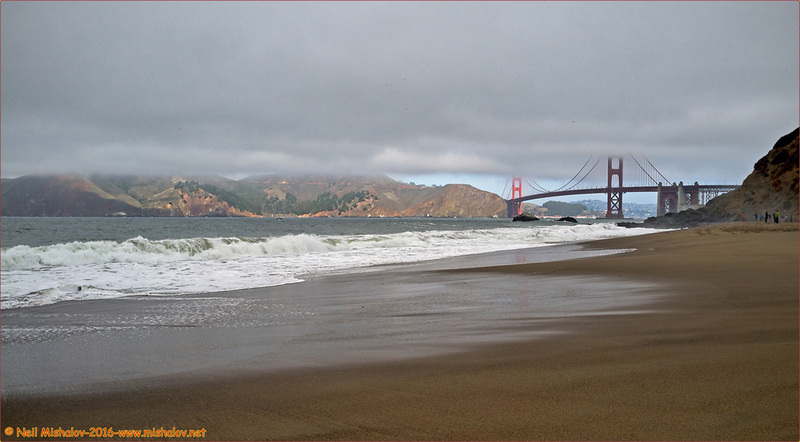 Another view from Baker Beach. The water in the Bay Area is cold year round because the ocean currents are coming from the frigid arctic region. Click on the image to see the full-size photo. This is the 'Sand Ladder' trail. 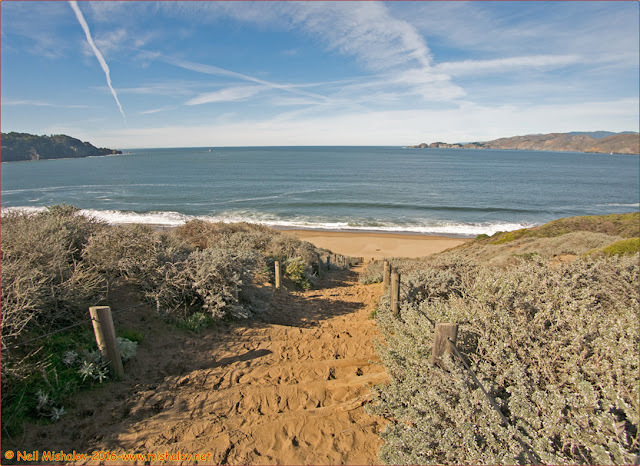 It ascends a sand dune from Baker Beach to Lincoln Boulevard. Click on the image to see the full-size photograph. This is an unusual gun battery. Against U.S. Army advice, the U.S. Congress authorized its construction. 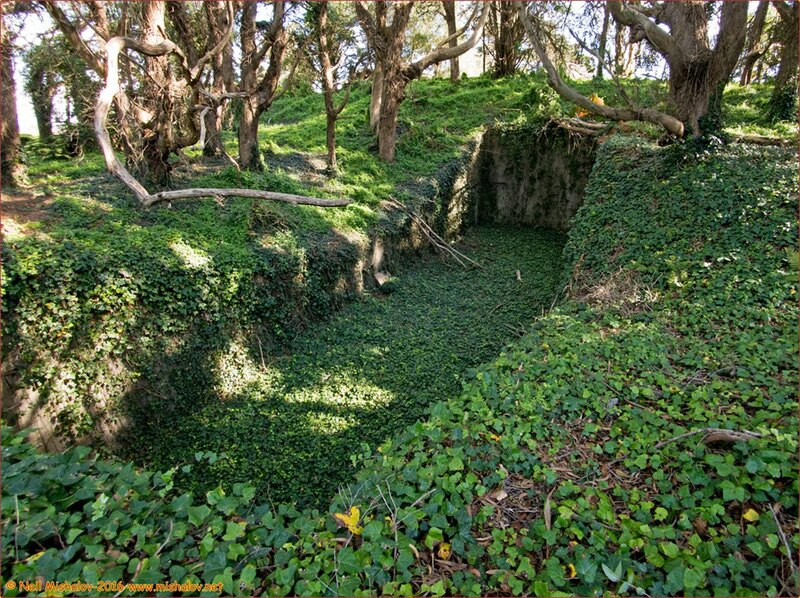 It was built by the Pneumatic Dynamite Company as an experimental Endicott Period coastal gun battery. It consisted of three 15-inch pneumatic powered dynamite guns. Work on the gun battery began on 6 March 1889. The construction consisted of three exposed 50’ circular concrete pads for mounting the guns and a separate powerhouse used to provide compressed air to power the guns. The compressed air rapidly forced the explosive shells out of the gun tubes. The explosive used in the shells was dynamite. Dynamite shells could not be used in standard guns because the impact of the propellant firing would trigger the dynamite and the shells would explode while still in the gun tube. Compressed air pushed the shells out of the gun tube at a lower velocity and with less impact. With the advent of the Spanish-American War, U.S. military authorities were concerned about the vulnerability of the exposed state of the experimental dynamite gun battery. 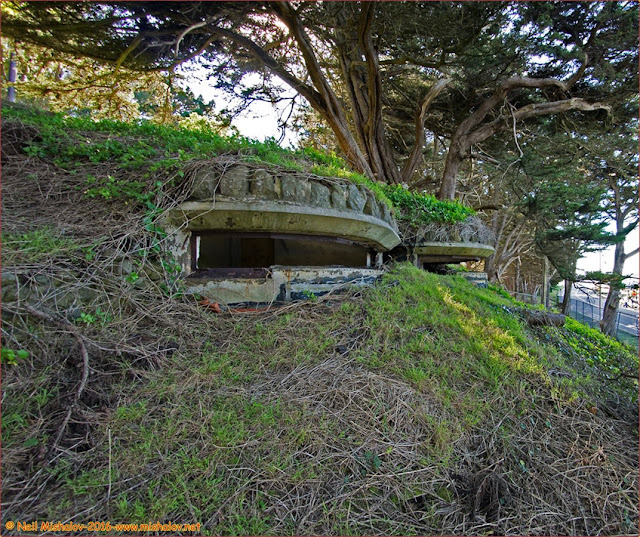 The battery's three gun emplacements were in plain view of the ocean. Also exposed was the powerhouse built behind the gun emplacements. It was therefore recommended that high earthen traverses be built around the three guns to make each emplacement position a gun pit. It was also recommended to create a high traverse around the powerhouse. These traverses would be supported by high and wide concrete walls. The work was approved, and construction began in August 1898. By March 1900 the work was completed, and on 8 June 1900, Battery Dynamite was transferred to the Coast Artillery. 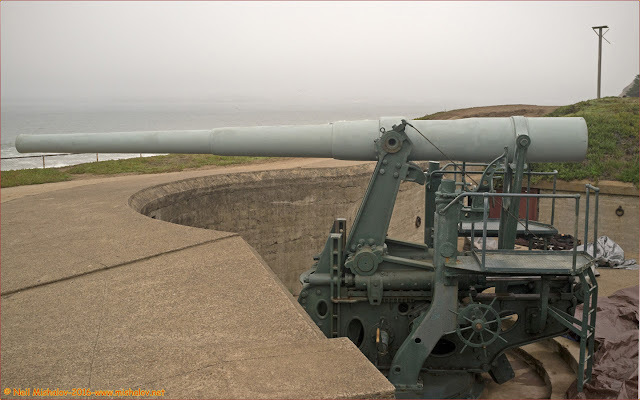 The guns were declared obsolete in 1901, in spite of the various improvements made to the battery. The three guns were ordered salvaged In 1904. 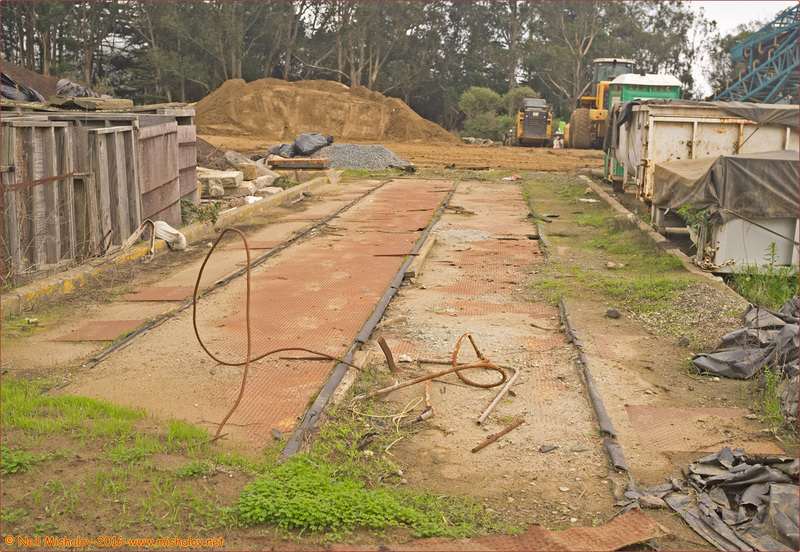 Once disarmed, the large complex at Battery Dynamite underwent many different uses over the course of many decades. The powerhouse continued to produce electricity until it was destroyed in the 1906 earthquake. A new powerhouse was later built in 1910 on the same site, and it provided electric power for the newly designated Fort Winfield Scott army post. By 1919, the artillery fire control switchboard and the Fort Winfield Scott telephone switchboard were also installed in the powerhouse. 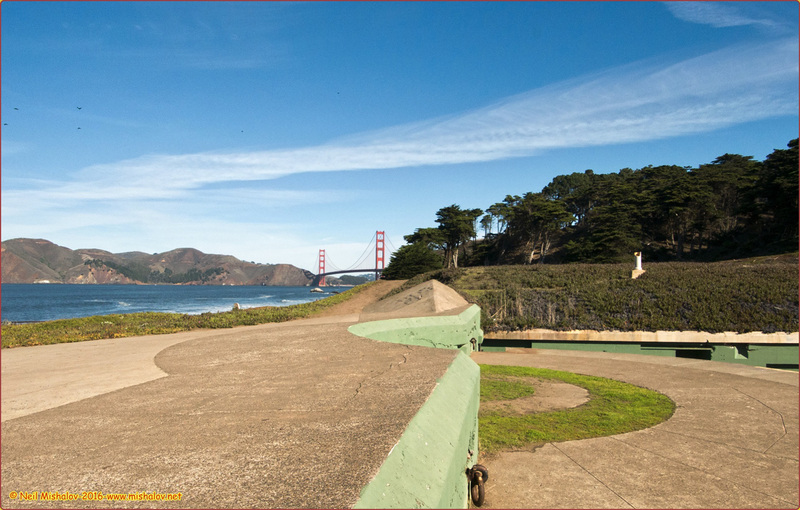 In 1911 a fire control station was constructed at the site of Battery Dynamite gun emplacement #1, and by 1940 the fire control station evolved into a Harbor Defense Command Post / Harbor Entrance Control Post for San Francisco Harbor. When the United States was at war in January 1942, it became apparent that the fire control station was not only too small, it was also vulnerable to air attack. Thus, a new two-story, Harbor Defense Command Post / Harbor Entrance Control Post was built during the war and accepted for service in January of 1944. The upper portion contained two concrete and steel pillbox observation stations, one for the Army and one for the Navy. 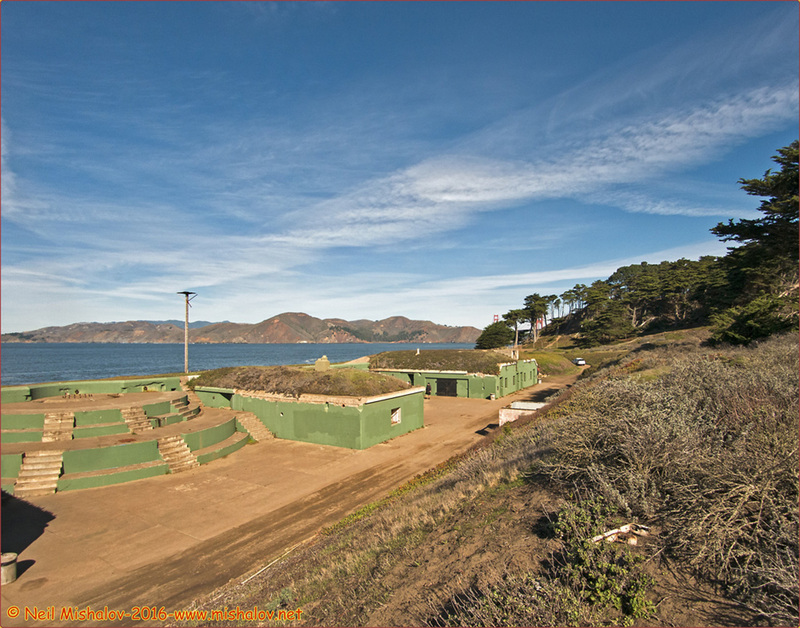 This new command post was built to the left of the old fire control station and in front of Battery Dynamite gun emplacement #2. The underground segment of the command post had sixteen rooms in which to house both Army and Navy personnel. 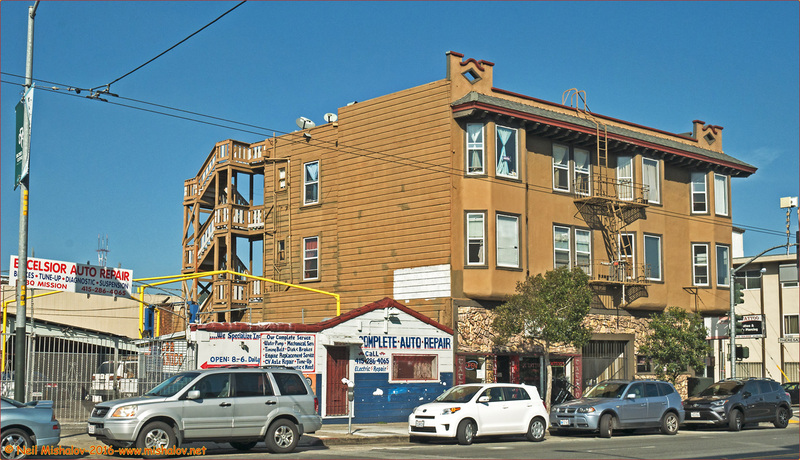 Battery Dynamite is off-limits to the public, for a good reason. It is a dangerous area to traverse. 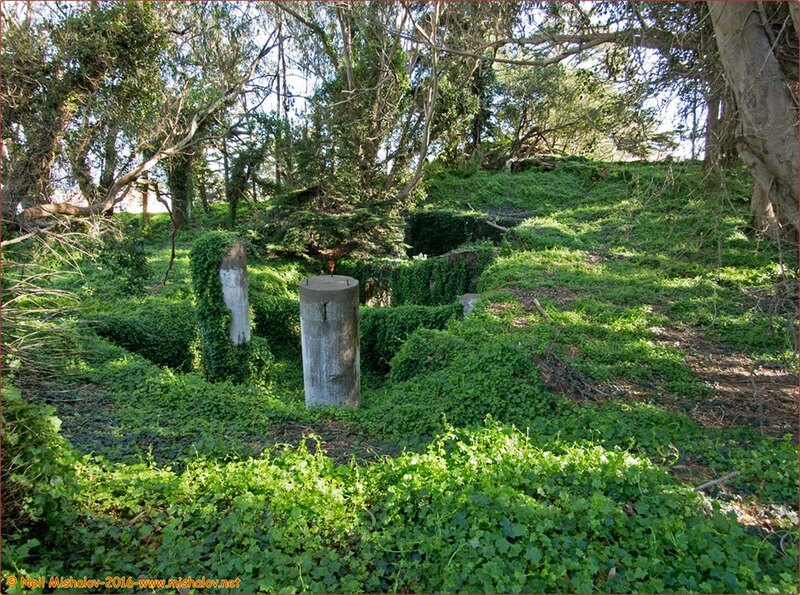 If unauthorized adults or children had access to the site, it is probable that some adults and children might fall 15 feet or more, into the bottom of a concrete gun emplacement. I was able to enter the Battery Dynamite site after I spoke with a National Park Service employee and mentioned that I wanted to take photographs of Gun Battery Dynamite and make the photos available for viewing on the Internet. This illustration, drawn in 1895, shows a 15-inch pneumatic dynamite gun at Battery Dynamite. Click on the image to see the full-size illustration. This is an aerial view of Battery Dynamite. The gun battery is located behind the enlisted men's barracks at the newly constructed Fort Winfield Scott. The view is looking east. Gun emplacement #1 is on the left. 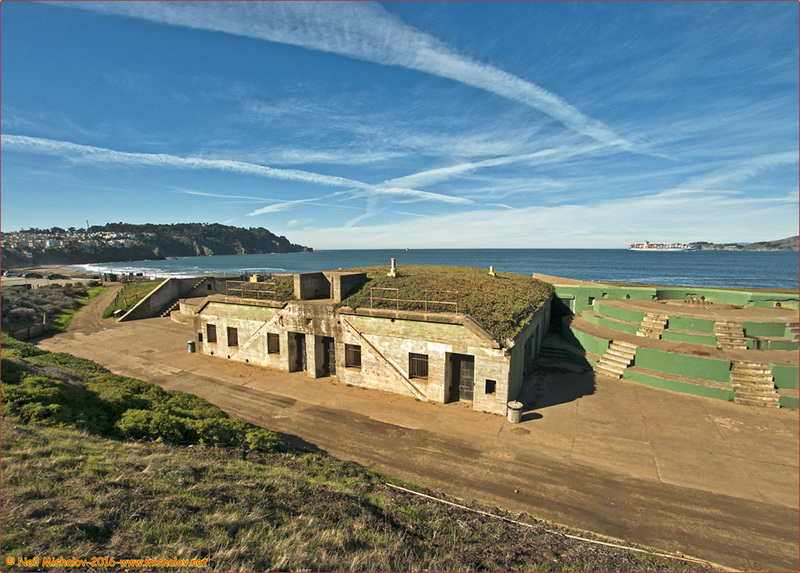 Visible are the earthen traverses surrounding the three gun emplacements and also the powerhouse, whose roof is visible behind the gun emplacements. This picture is circa 1930. Click on the image to see the full-size photograph. This is a view looking north from the parade ground at Fort Winfield Scott. 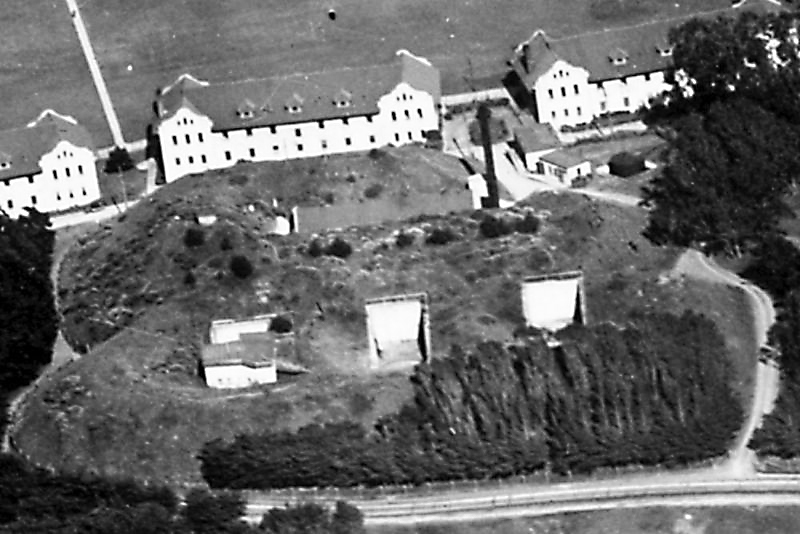 Visible are three of the ten enlisted men's barracks which were constructed between 1908 and 1912. The treed area straight ahead behind the barracks is the location of Battery Dynamite. Fort Winfield Scott was established specifically to provide personnel to fire and maintain the many Endicott Period gun batteries that were built at the Presidio between 1885 and 1912. Fort Scott was activated in 1912 and decommissioned in 1948. Click on the image to see the full-size photo. This is a photo of the Battery Dynamite powerhouse. 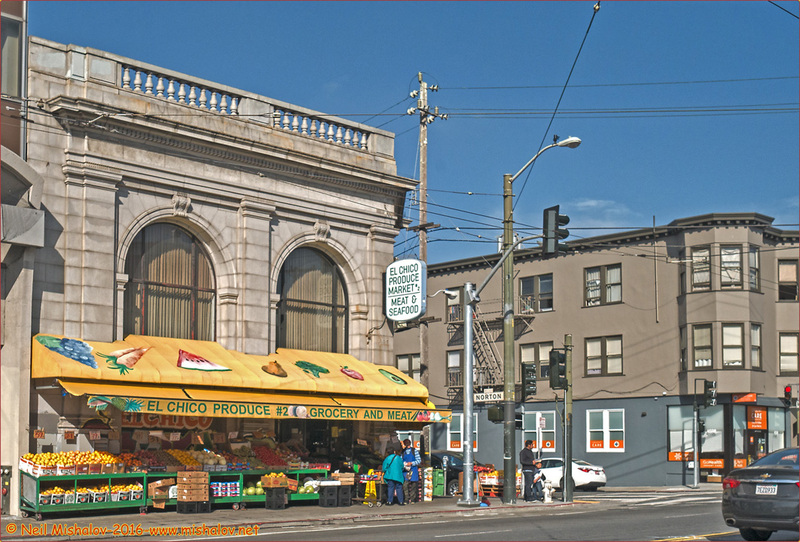 It went into service in 1910, replacing the original powerhouse which was damaged during the 1906 earthquake. Note the height and width of the concrete walls that protect the powerhouse from the potential of enemy fire. Click on the image to see the full-size photograph. This is a view of the three Battery Dynamite gun emplacements. The picture was taken before the installation of the earthen traverses and concrete walls which were built around each gun emplacement. This image is circa 1897. Click on the image to see the full-size photo. This is a photograph of a dynamite gun which was just test fired. There is no smoke or flames visible because the round that was just fired was shot from the gun by pressurized air. You can see the explosive dynamite shell in the air, if you look closely. This picture was taken in 1895. Click on the image to see the full-size photograph. This is Battery Dynamite gun emplacement #1. 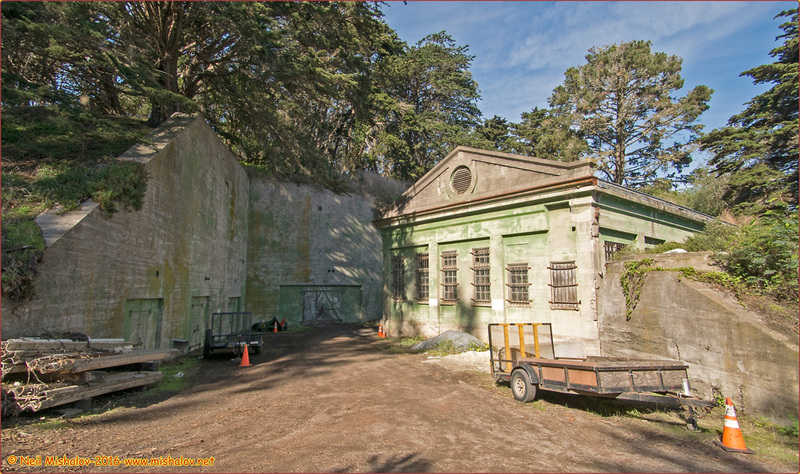 During 1911 a fire control station was constructed in gun emplacement #1. The fire control station was placed on top of the large round concrete mounts which were installed at the base of the gun emplacement. Click on the image to see the full-size photo. This is Battery Dynamite gun emplacement #2. The entire area of Battery Dynamite is significantly overgrown with plant ground cover. Click on the image to see the full-size photograph. This is gun emplacement #3. Note the depth of the gun emplacement and the lack of protection for a person from falling into the concrete gun emplacement. Click on the image to see the full-size photo. Here is a view of the two pill boxes built atop the two-story Harbor Defense Command Post / Harbor Entrance Control Post. This fortification was built during World War II, and it was accepted for service on 8 Jan 1944. The upper story contains two concrete and steel pillbox observation stations, as seen above, one for use by the Army and one for use by the Navy. This new structure was constructed in front of Battery Dynamite gun emplacement #2. The lower underground portion of the command post has sixteen rooms which were used to house both Army and Navy post personnel. Click on the image to see the full-size photograph. This Google Earth map shows the route I took through the Presidio on 5 November, a foggy Saturday morning. I first visited Battery Chamberlin and then went to the location of Nike Missile Launching Site SF-89L. 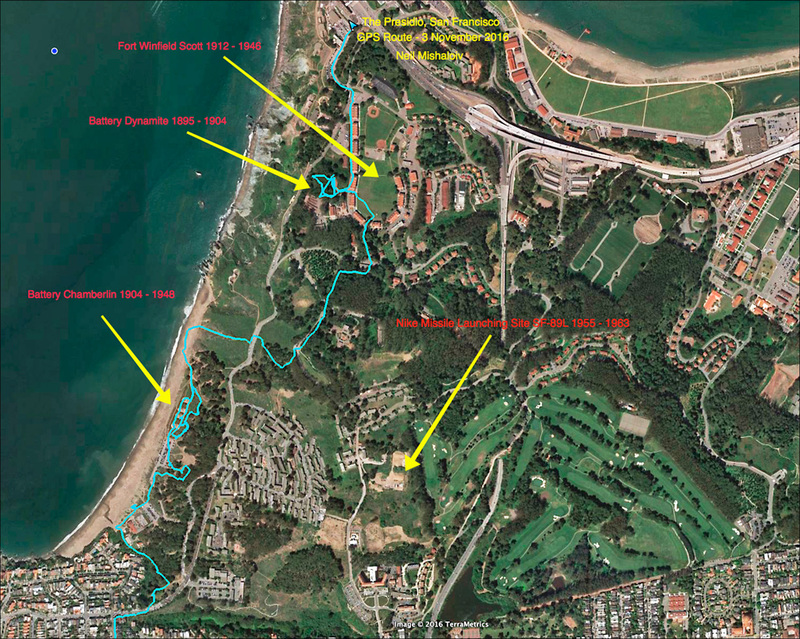 Click on the image to see the full-size Google Earth map. 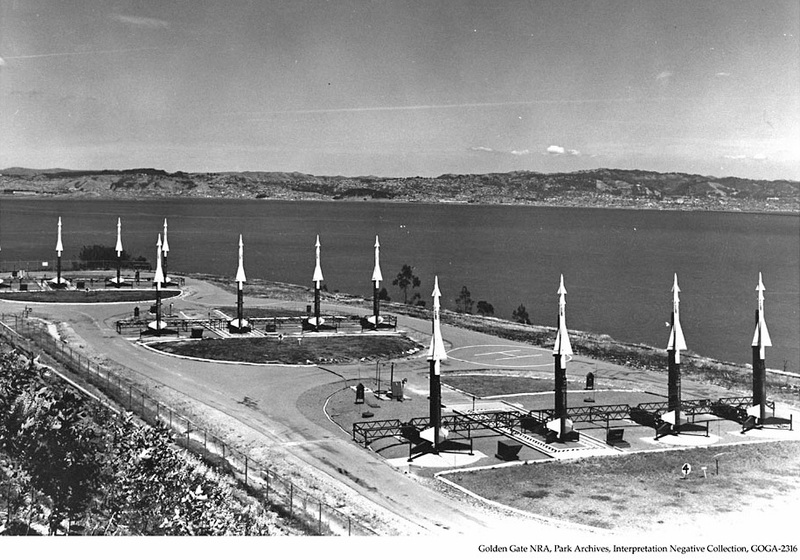 This photograph shows one of the three missile launching pads at SF-89L. 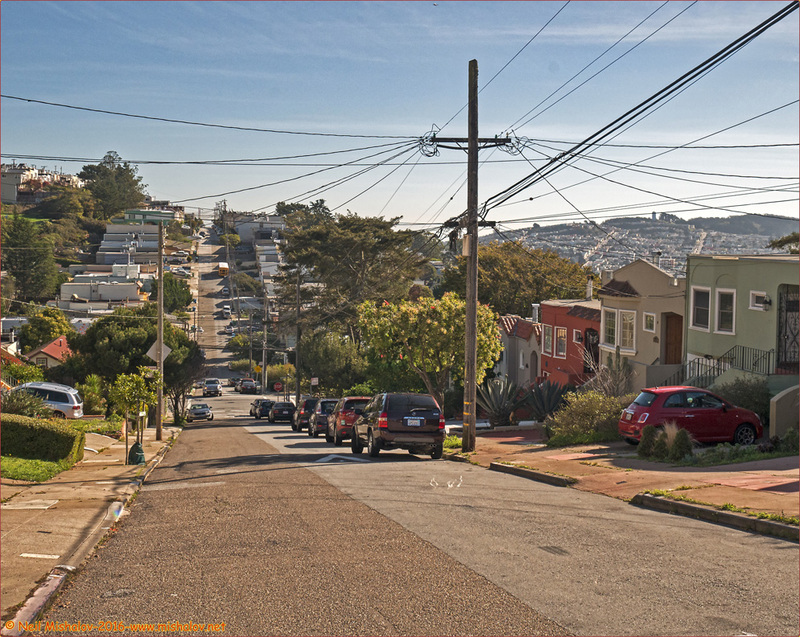 The houses in the distance are located in the Richmond District of San Francisco. The mountain on the far left is Mount Sutro. Sited at the summit of Mount Sutro at an elevation of 911 feet (278 meters) is radar tracking site SF-89C. It was designed to guide the missiles towards incoming enemy aircraft. The picture is circa 1958-1960. Click on the image to see the full-size photo. This is one of the three SF-89L hydraulic lifts used to raise the missiles from their underground storage area. Click on the image to see the full-size photo. This is the second of the three hydraulic lifts used to raise missiles from an underground storage area. 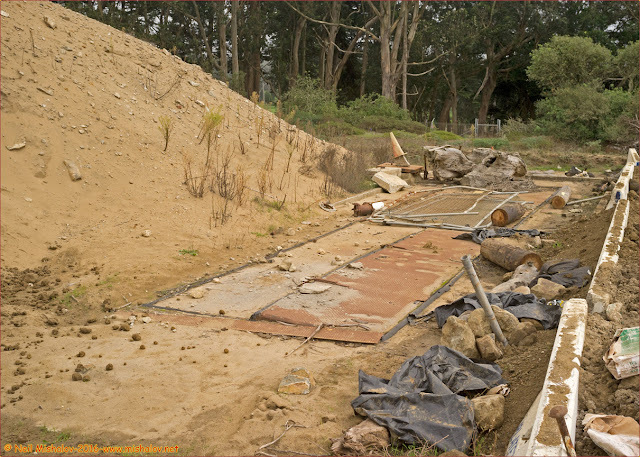 I was unable to locate the third hydraulic lift; it appears that the third underground missile storage area has been filled with sand and covered with dirt. Click on the image to see the full-size photograph. This Google Earth map shows the location of the SF-89L launching site in the Presidio, and also the location of the SF-89C radar tracking station on the summit of Mount Sutro. Every one of the 300+ Nike Missile sites built in the U.S. had a separate launching location and radar tracking location. The distance between the two locations as seen above is approximately 2.5 miles. 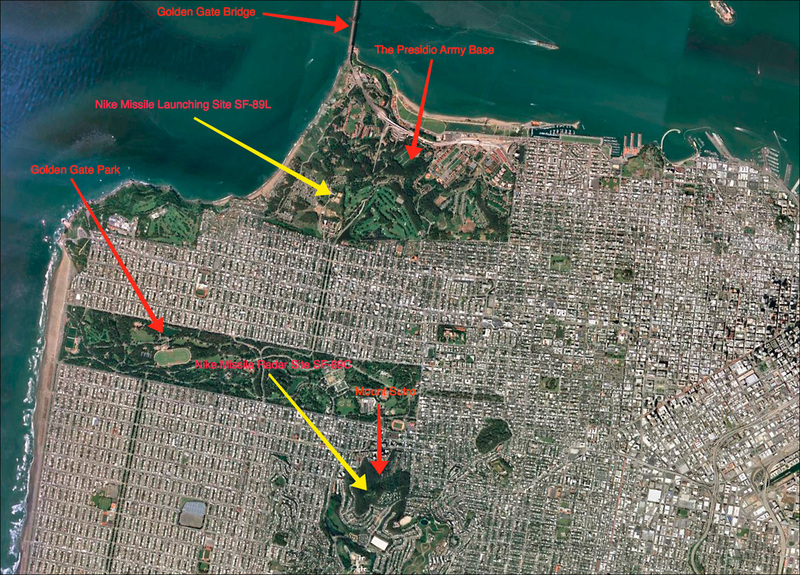 Click on the image to see the full-size Google Earth map. To conclude this gallery of photographs I have chosen this view of Nike Missile Launching Site SF-91L which is located on the southeast side of Angel Island. 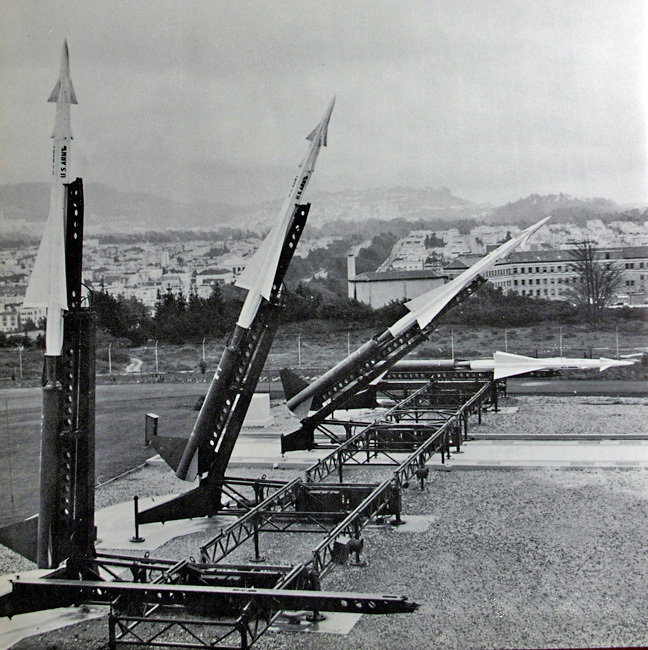 The photo shows all three launching platforms, each of which can fire four missiles simultaneously, if necessary. The Berkeley Hills are across San Francisco Bay in the background. The view is looking east. The picture was taken sometime between 1955 and 1961. Click on the image to see the full-size photograph. A Panasonic GX7 camera body mounted with either an Olympus 17mm lens or an Olympus 9mm lens was used to take these photographs.